The Smithsonian museum is said to be the attic of America. 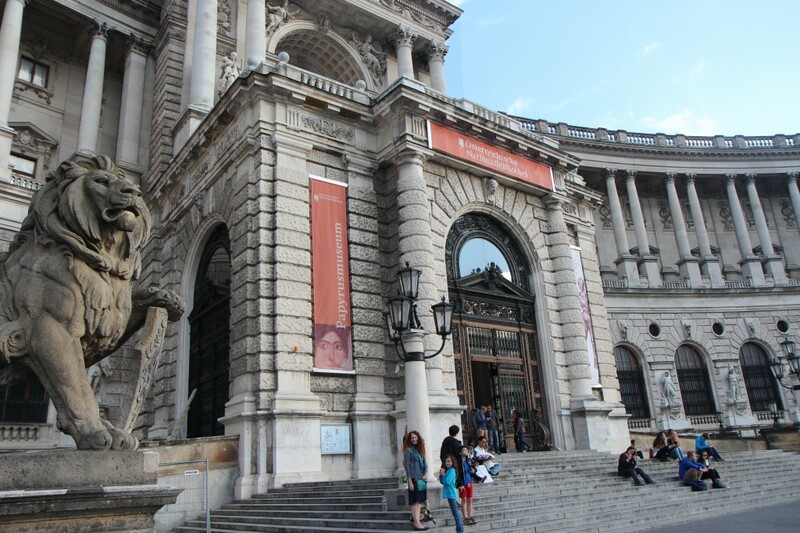 Perhaps its Viennese elder brother would be the museums the Habsburgs displaying their diverse wealth. Their Hofburg Palace in Vienna housed some of the most powerful people in European history—the Habsburg emperors—for over 600 years. 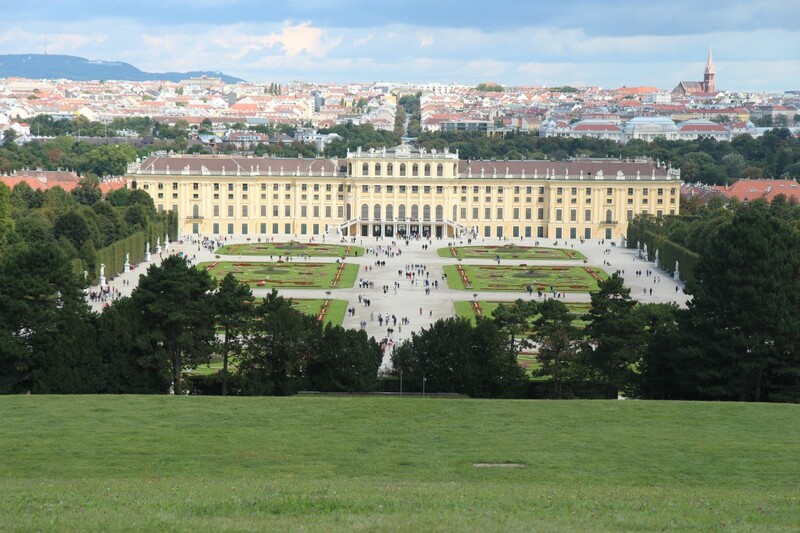 The Hofburg Palace was the winter residence of the House of Habsburg (Schönbrunn was the summer residence). 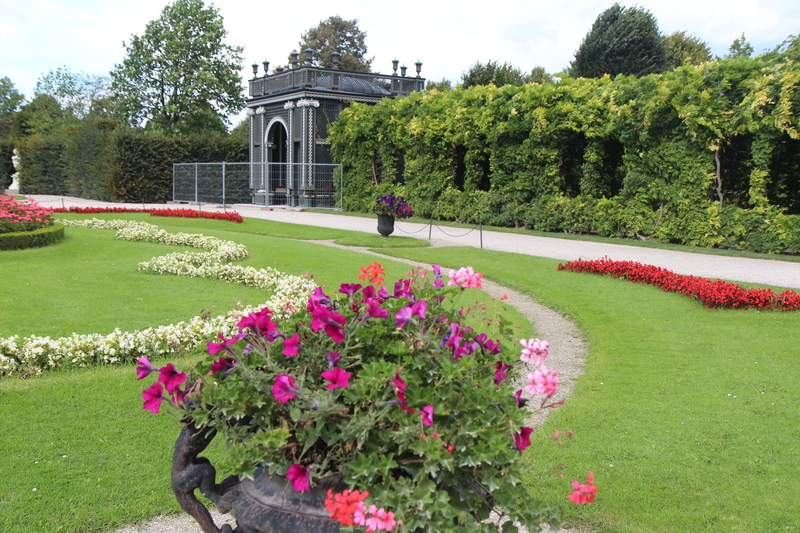 It is still the official residence of the President of Austria. The world’s largest palace by floorspace, grasping the size of the place or even finding what you are looking for stumps you because it is so large and convoluted. It certainly eludes any tidy photo. 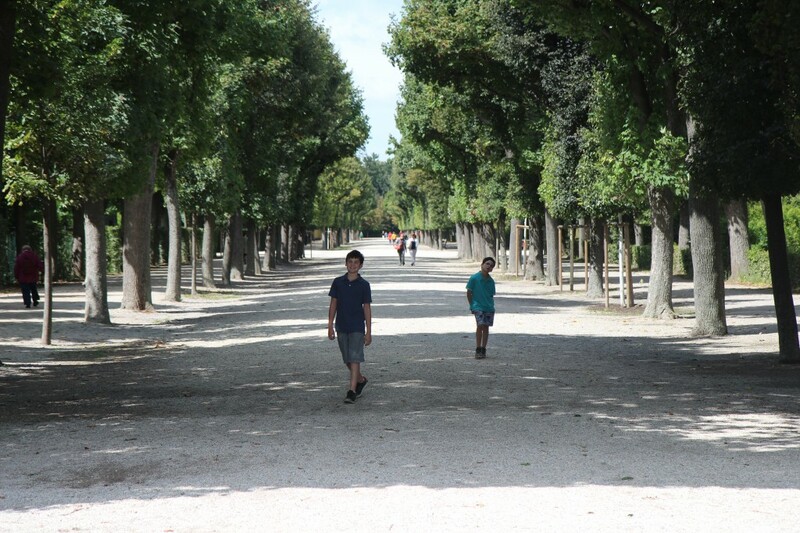 We walked around various parts of the extended and separated halls and museums to find where we were going. 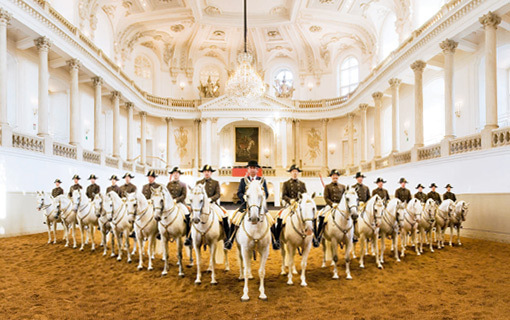 One day we found the Spanish Riding School which is just one hall of the palace. Another day we enjoyed a picnic on the grass of the Butterfly Garden. 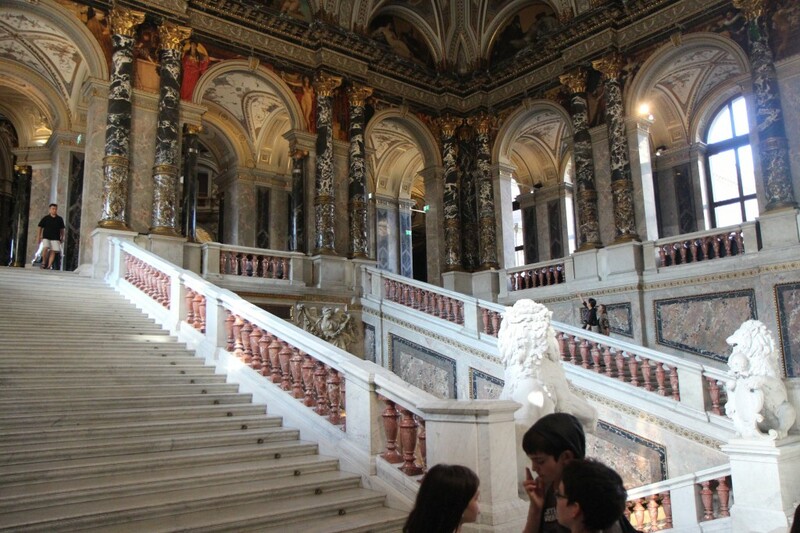 The enormous Natural History Museum and Kunsthistoriches (“Art History”) Museums also belong to the palace. 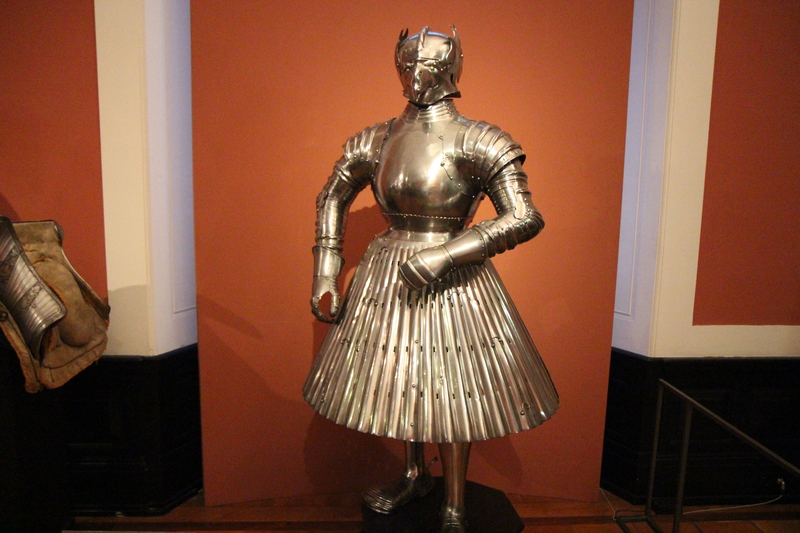 The Albertina Art Museum displays Dürers and Klimts. 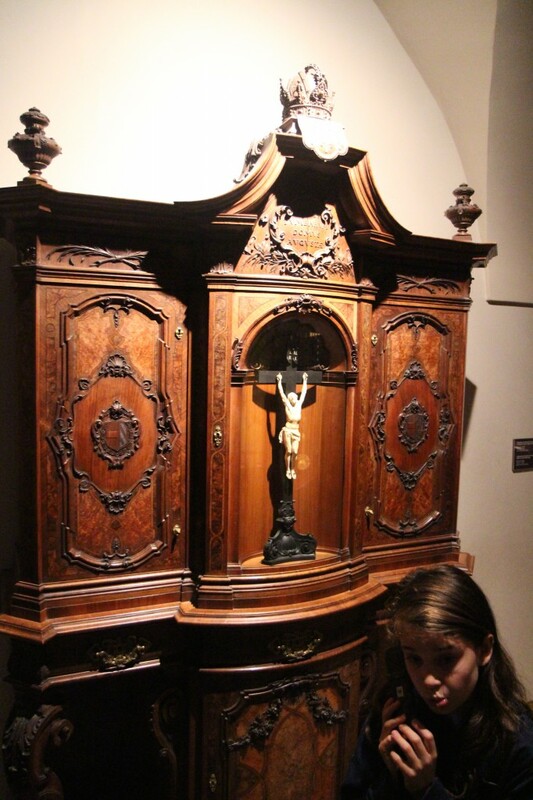 We saw only a few of the pieces in the Collection of Ancient Musical Instruments. Doesn’t everybody have one of those collections? There are more ceremonial halls and wings than you can hit with a dead cat. 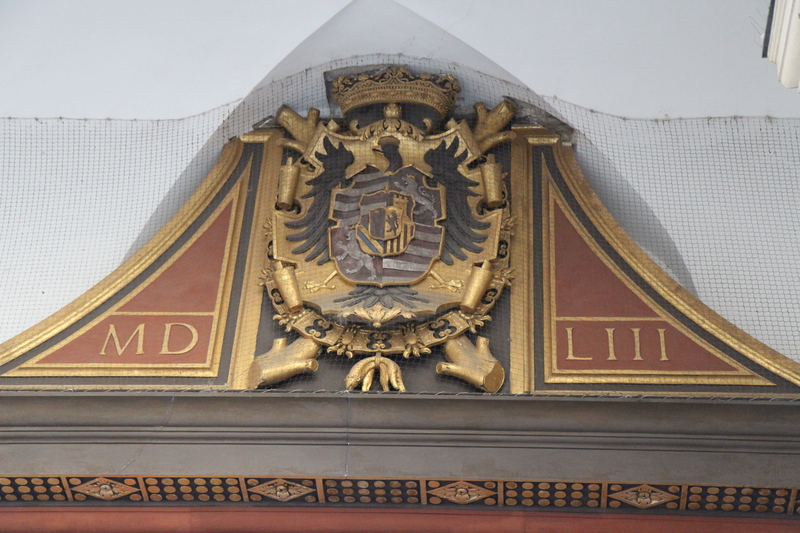 The royal family lived in the Imperial Apartments. The oldest wing, the Swiss wing, dates from the 13th century and is named for the Swiss mercenary guards who maintained security. 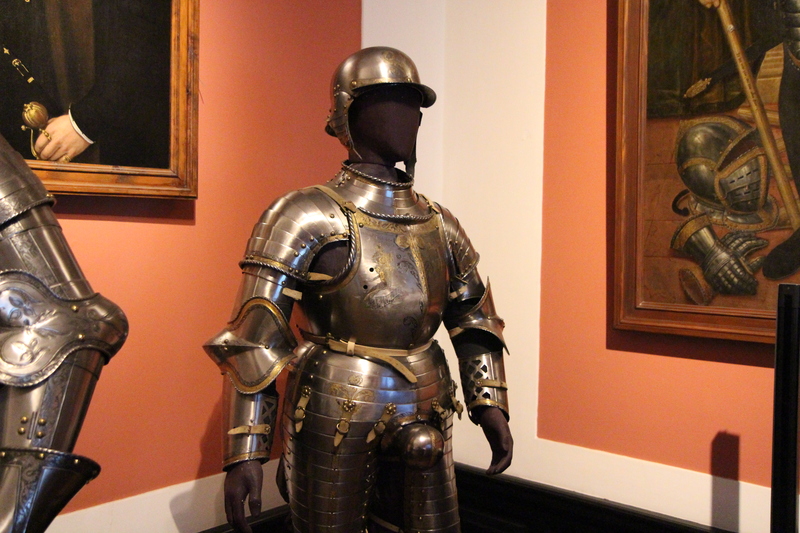 I wonder if this is the same setup as what we still see of the Vatican’s Swiss guards. The Vienna Boys’ Choir sings at High Mass here in the Chapel of the Imperial Palace. The Hofburg covers 59 acres and constitutes 18 ranges of buildings, 54 major staircases, 2,600 rooms and still employs over 5,000 people. 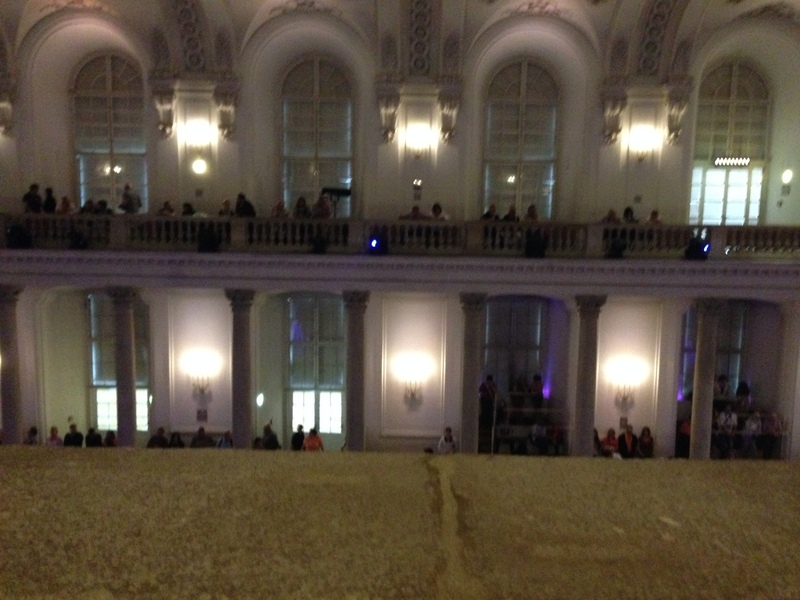 The Neue Berg (“New Palace”) portion was finished at the end of the 19th century. 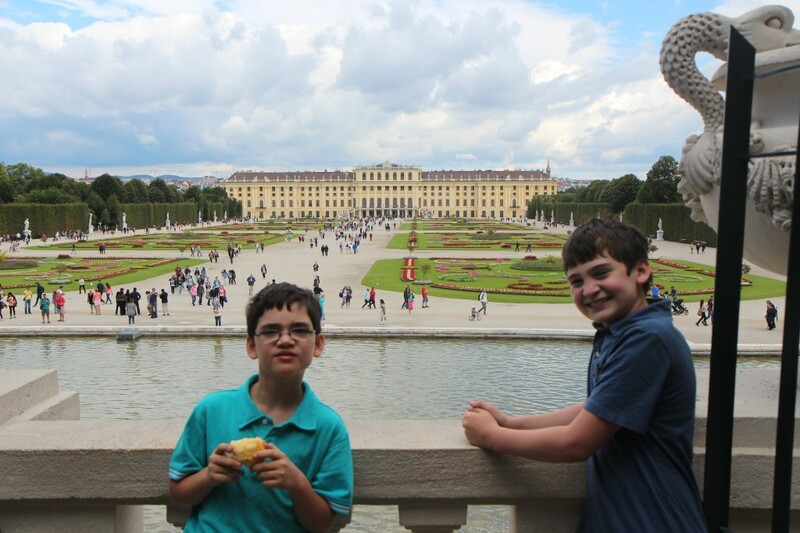 Prince Eugene and Archduke Charles statues dominate the foci of the curved Neue Berg Palace . They battled the Ottoman Turks and Napoleon, respectively. In 1938, Hitler stood here before cheering crowds and announced the annexation of his home-country of Austria by the Third Reich. How could the cheers happen? 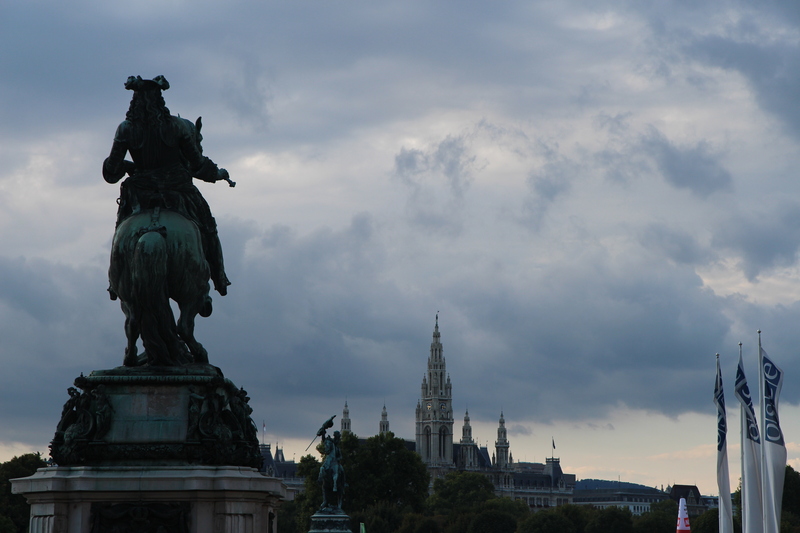 A guidebook suggests that perhaps by imagining the great disappointment the Viennese might have felt as they lost their “empire” in 1918 we can begin to understand. This wing of the palace holds the enormous collections but still manages to feel nearly empty. You wander the halls getting from one place to another. The Ephesus Museum makes you scratch your head, “what’s all this doing here?” The items all come from the famous town of Ephesus in modern-day Turkey. The actual Temple of Artemis is here. By the mid-19th century the Austrians and Turks were getting along after years of terrible warfare. Viennese archaeologists made several expeditions to Ephesus and shipped back these treasures. 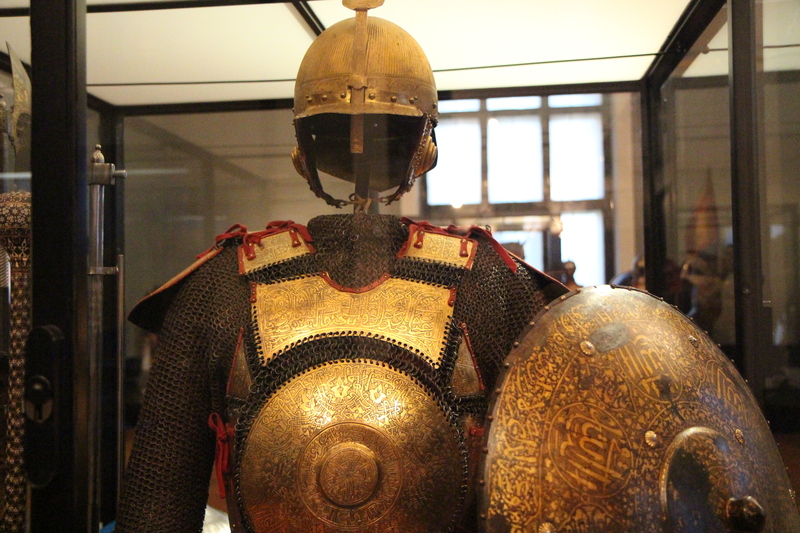 Some of it was gifted by the Turks to the powerful Habsburgs. Laws were finally changed in Turkey to stop this cultural transfer (or looting!). The British Museum in London has some of this same feeling. 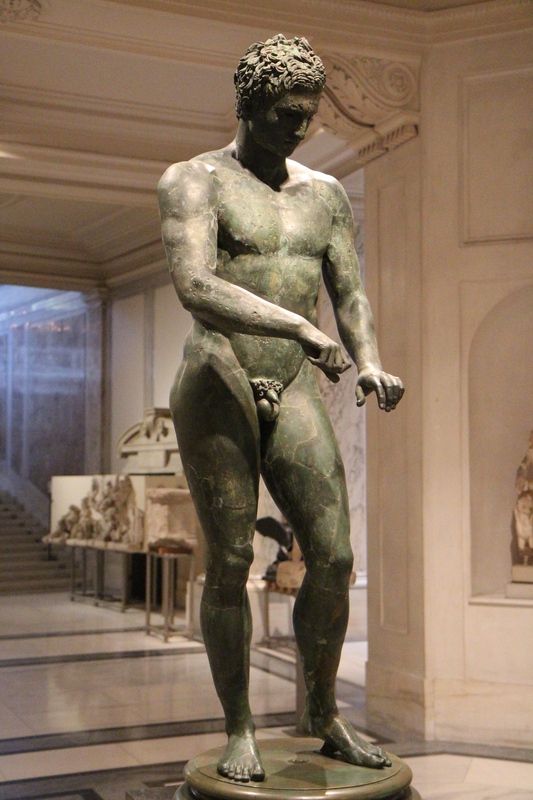 The statue of the athlete behind Ana was found in over 230 pieces and reconstructed over years. 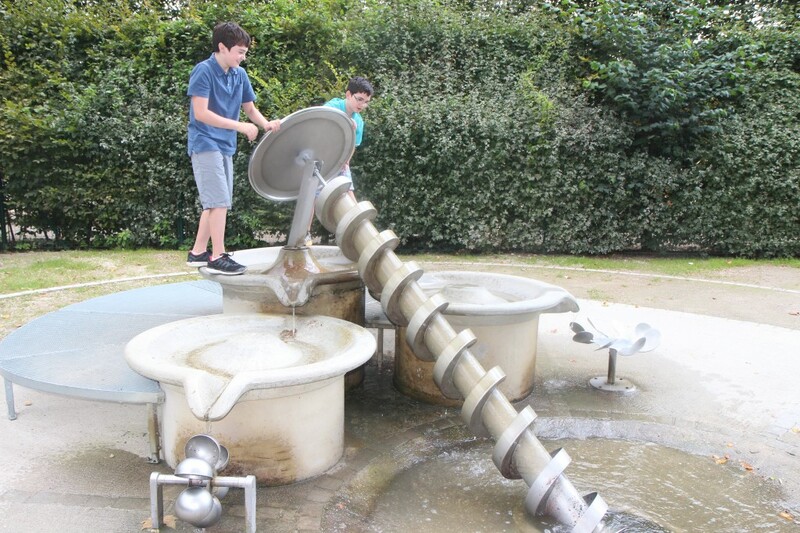 The sculpture captures him cleaning his “stirgil”(? 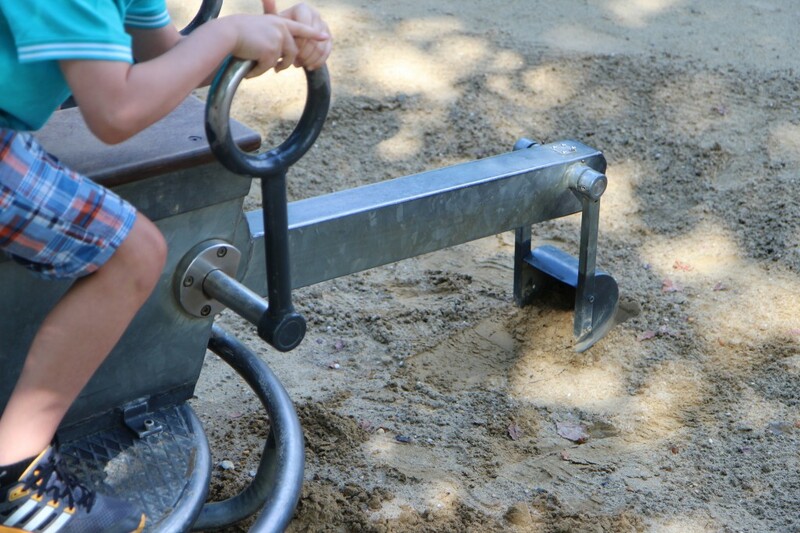 )—an instrument used to scrape off all the oil they’d put on their bodies for the athletic contests. 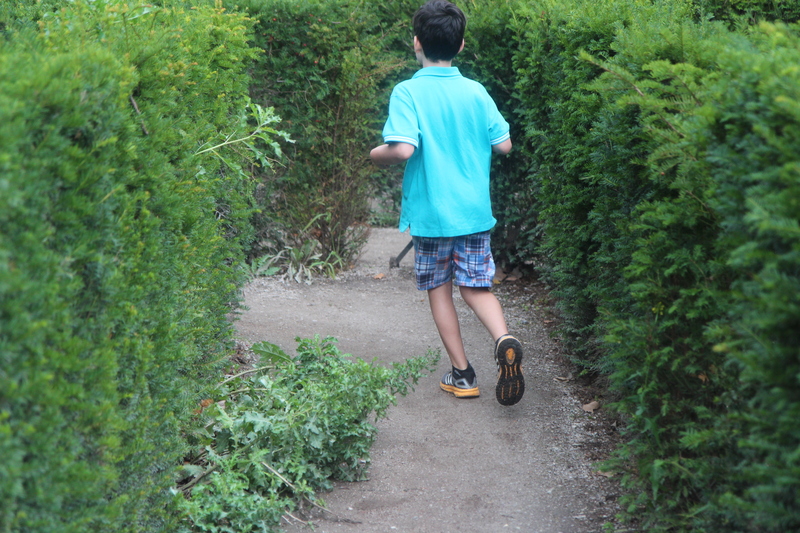 These days our athletes just rip off their jerseys… The kids enjoyed the museum for about eight seconds, then talk turned to ice cream and if Mommy and Daddy had any immediate designs on any—right now. 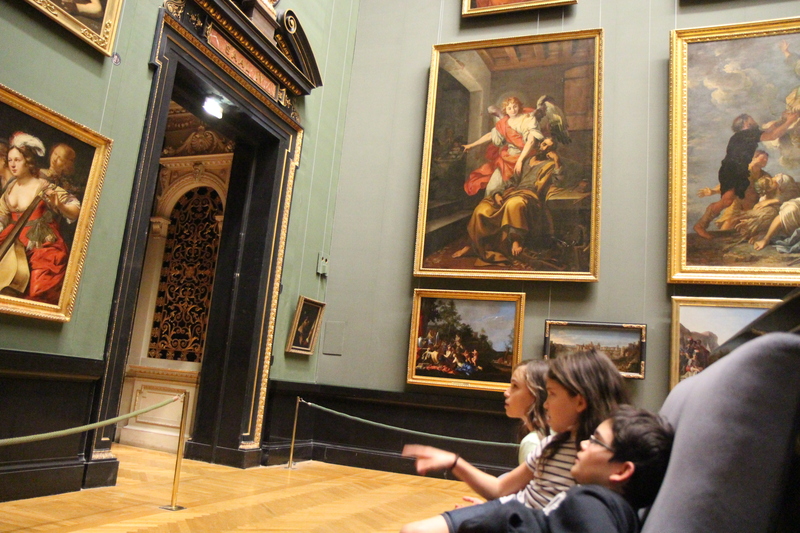 We loved the Kunsthistoriches Art History Museum. 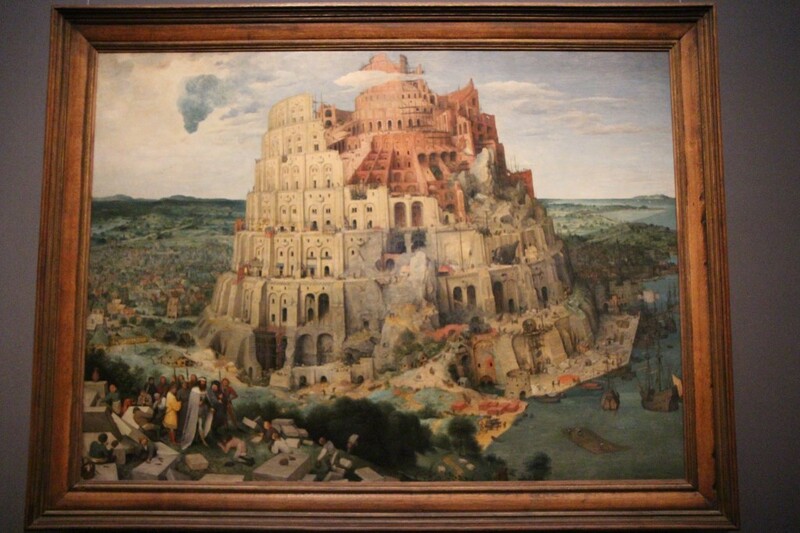 Brueghel’s “The Tower of Babel” and “The Hunters in the Snow” made us want to go Holland to see more. 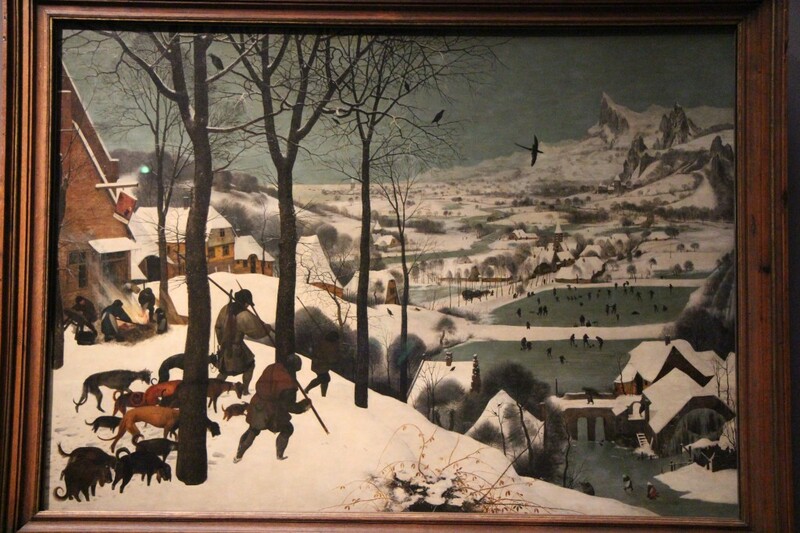 In his “The Hunters in the Snow “you can see aspects of winter village life (ice skating, socializing, cooking) going on as the hunters return. 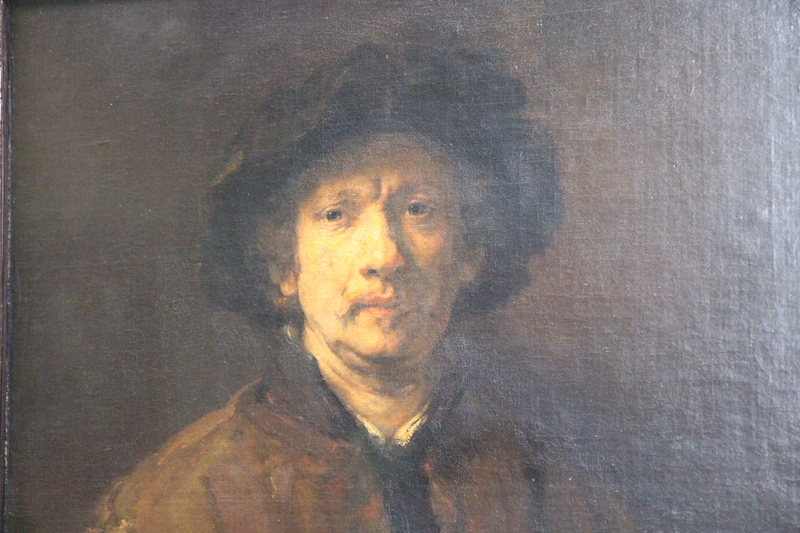 There are works by Raphael, Rembrandt, Velazquez and Vermeer. We could have put in hours here but time and hunger would not allow. It made me flash back to visiting the Louvre with our aircrew during a deployment to France (I know, I even had the nerve to write that out loud). 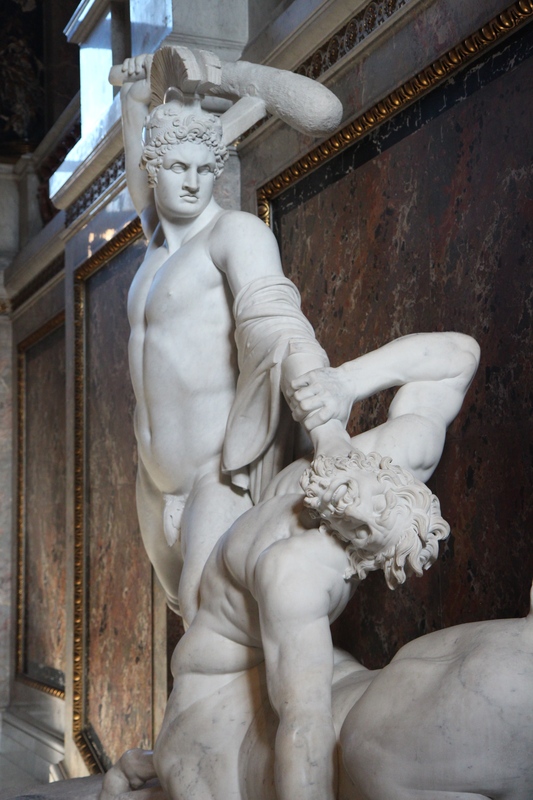 We had about ninety minutes in the Louvre and I have memories of nearly sprinting from room to room. It sure is fortunate that I was such an art scholar then to be able to take it all in so quickly… Anyone have a similar experience? 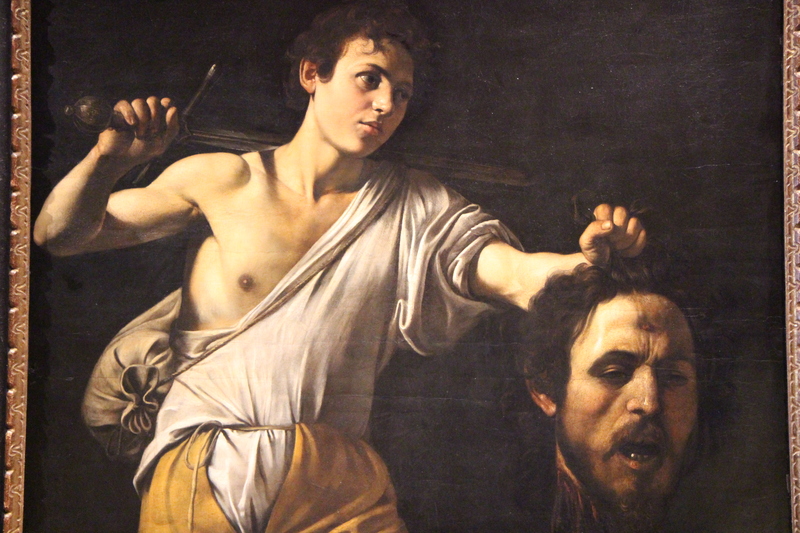 Caravaggio painted his own face on the vanquished Goliath. He hired a homeless youth to paint him as a young David. 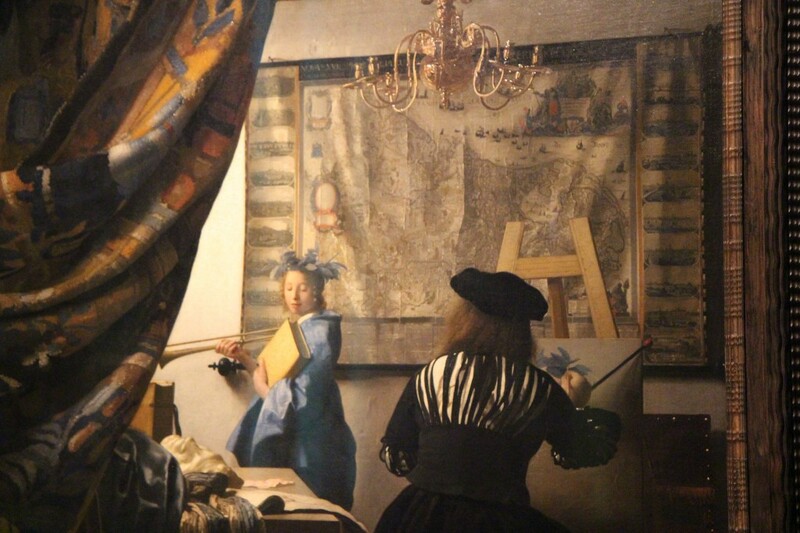 Vermeer’s “The Art of Painting” shows him in his studio painting a model. You can hardly take your eyes off this one as his details draw you in. The curtain is drawn back, bringing the viewer into the scene. 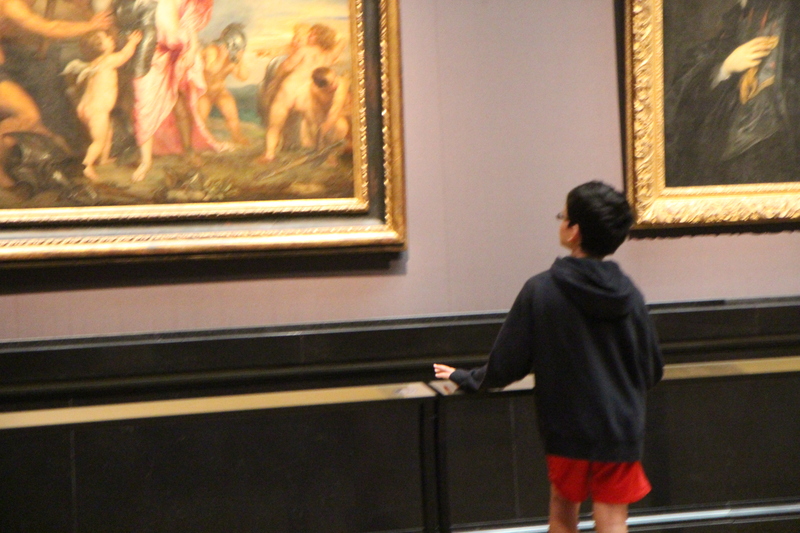 Luke really savoring the art. 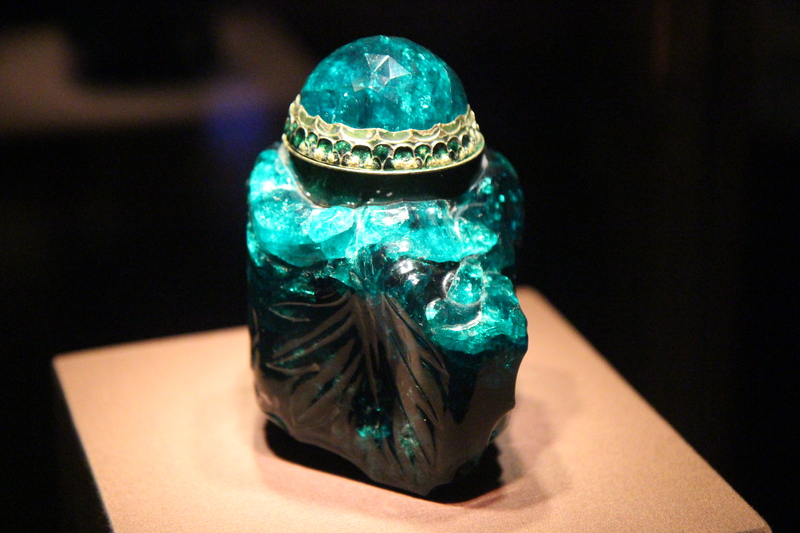 The Imperial Treasury’s artifacts were beyond belief. A unicorn’s horn over seven foot long stands in one corner. 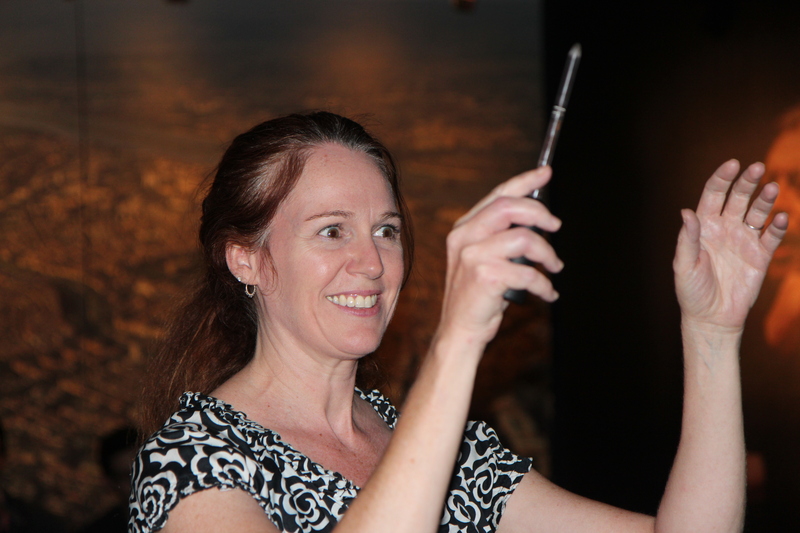 Now we know it as a narwhal’s tusk. This cabinet holds the keys to several centuries worth of Habsburg crypts. 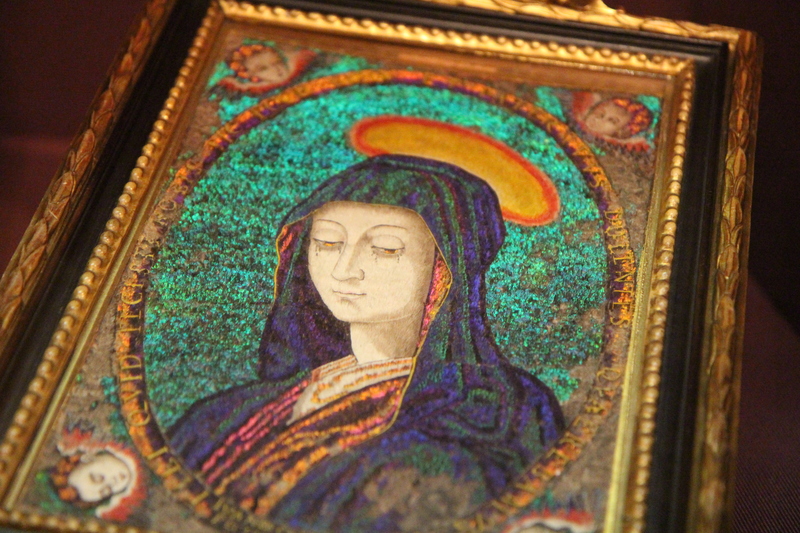 Ancient Mexican artwork made entirely of feathers. 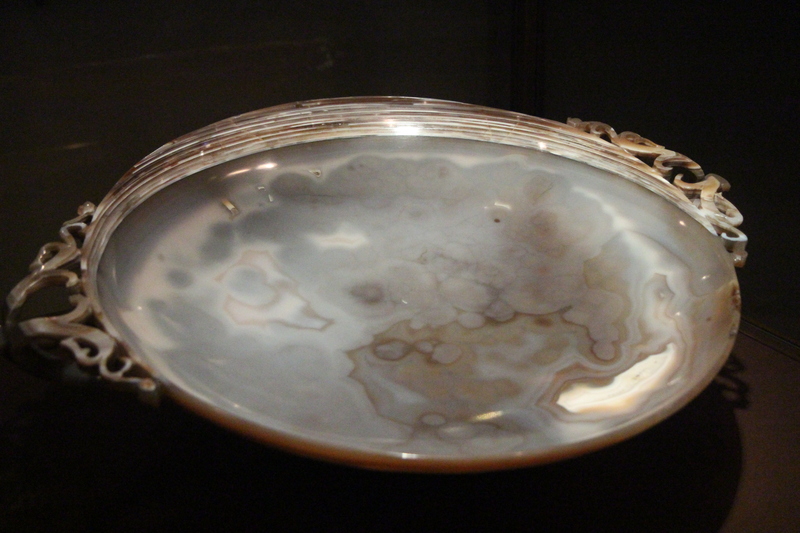 This exquisite agate bowl is thirty inches in diameter and carved from one enormous agate in Constantinople in the fourth century. For centuries it was thought to be the most valuable of the collection. A natural miracle apparently reveals a mysterious inscription of KRISTO (“Christ”) and likely led to the legend that it was the Holy Grail. 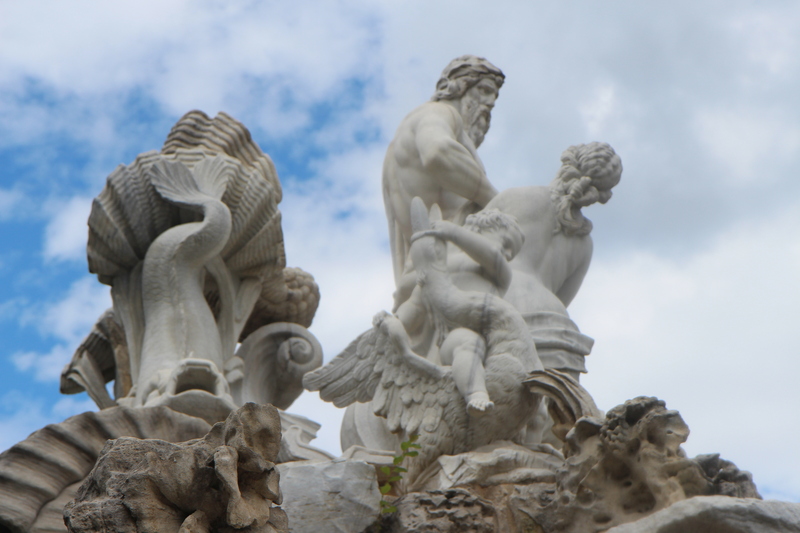 It is said the writing is not carved but appears in the natural veining of the stone. Napoleon defeated the Austro-Hungarian empire and dictated terms. After Josephine was unable to produce a male heir he divorced her and took a wife from the defeated royal family. 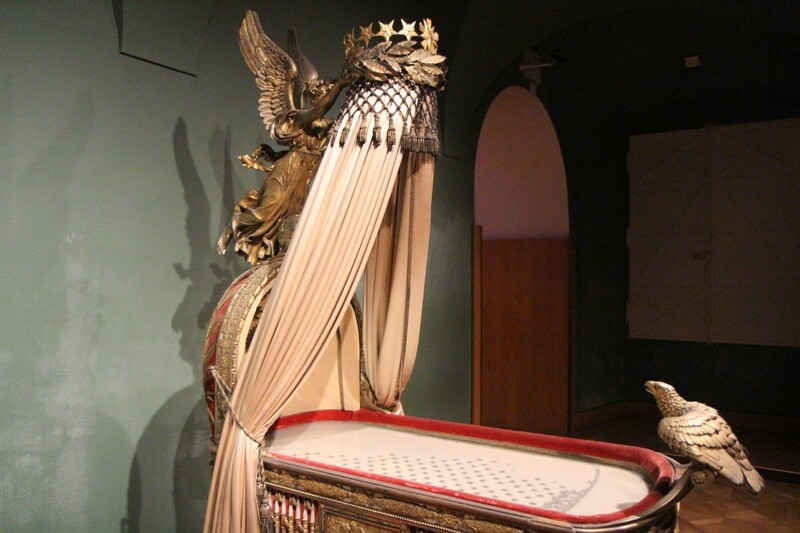 This cradle was for that son, the styled “King of Rome”. How’d you like to lose a war to Napoleon then have him marry into your family to increase his power? The 1805 French defeat of the Russo-Austrian army at Austerlitz ended the Holy Roman Empire. Holy Roman Emperor Francis II abdicated the imperial throne, keeping only his official Austrian title. 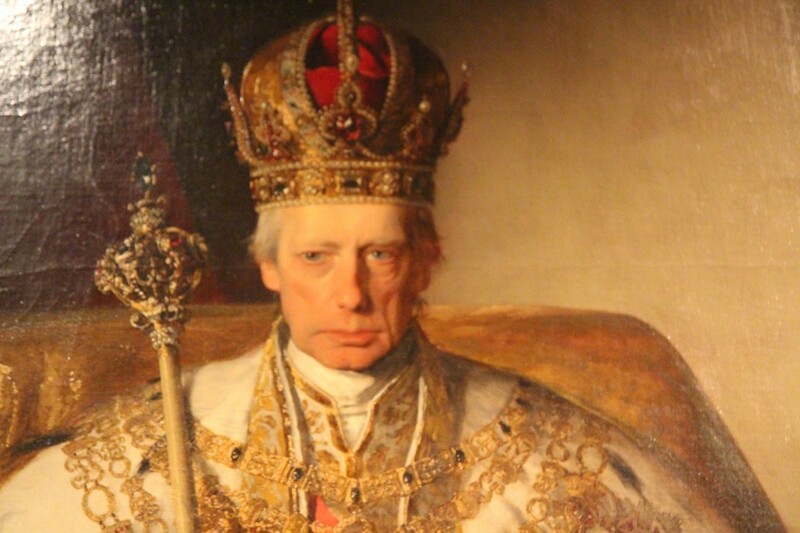 This was the emperor who had to give his daughter, Marie Louise, to Napoleon for a marriage of state. 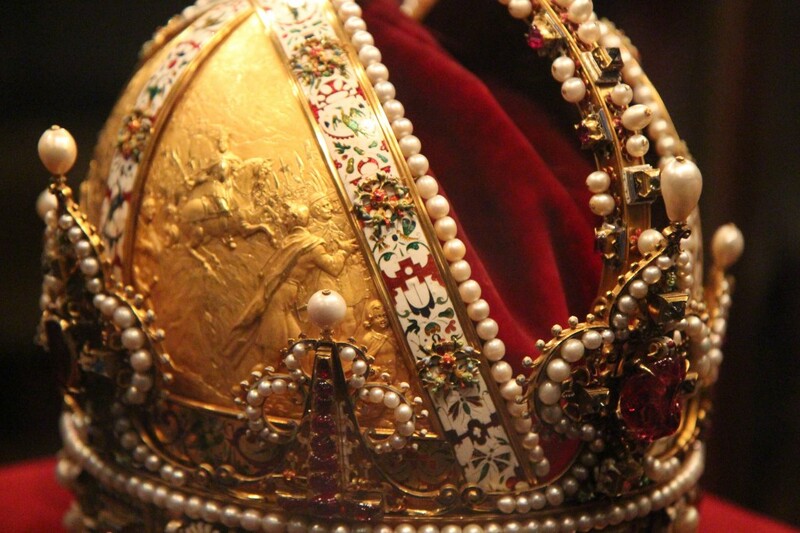 The actual crown of Austria with impossibly fine goldsmithing detail. 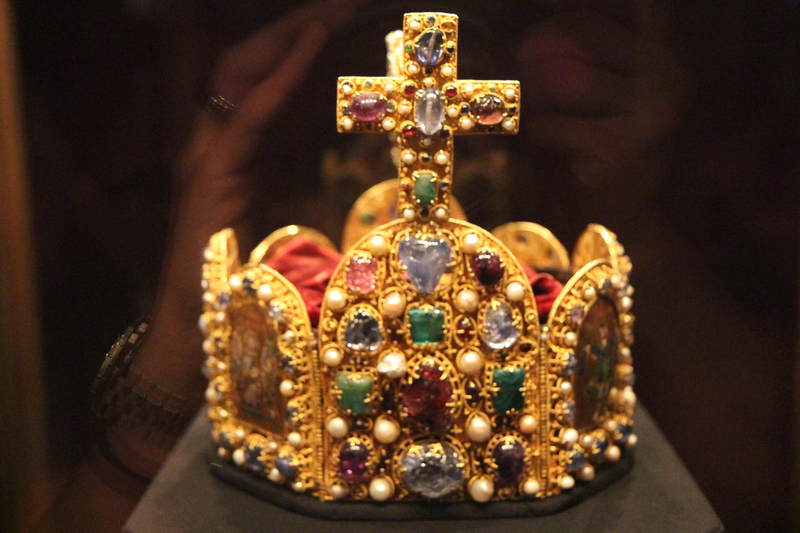 The far earlier crown of the Holy Roman Emperor, from the 11th century. 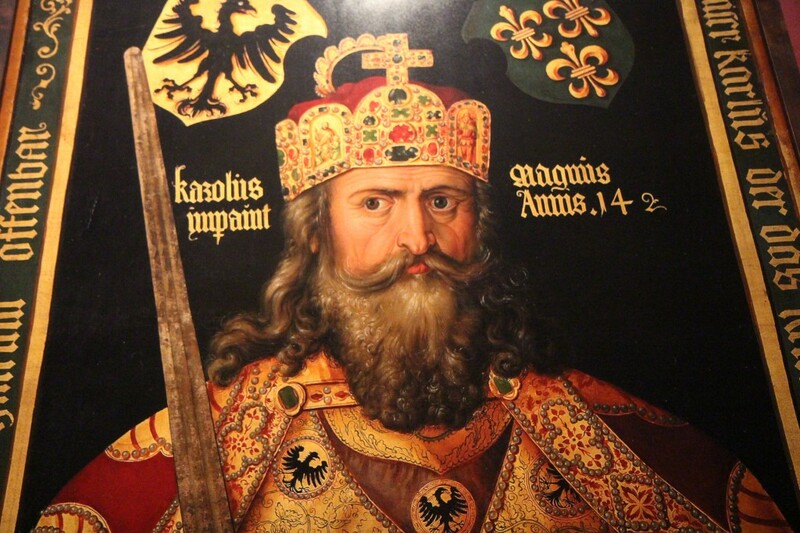 Charlemagne was crowned the first Holy Roman Emperor in 800. 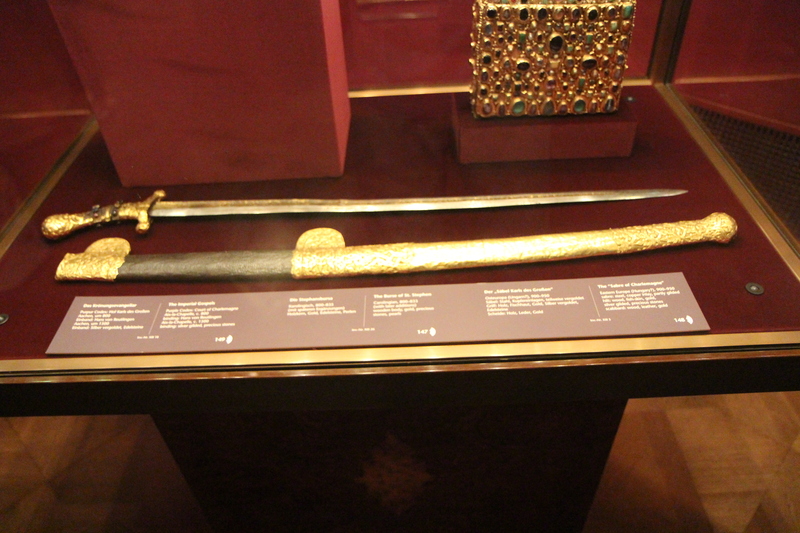 This is (supposedly) his sabre, as the Habsburgs were eager to establish a link between their House and this esteemed leader. 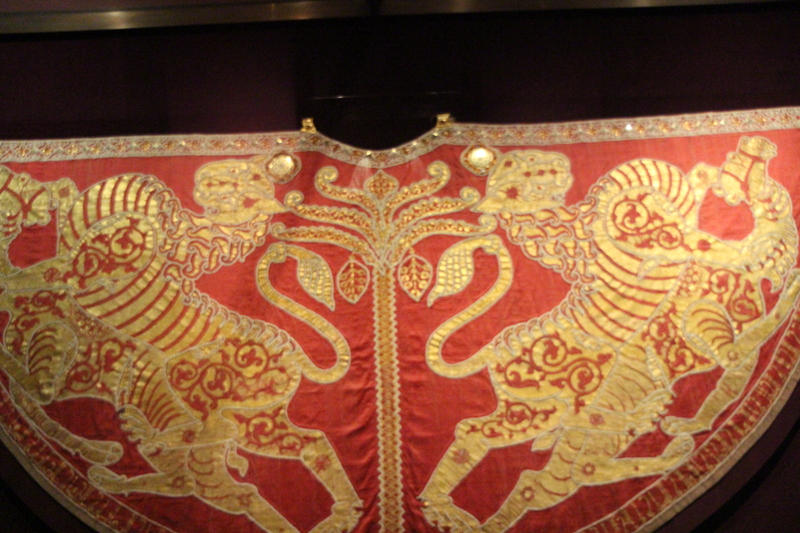 The coronation mantle for the Holy Roman Empire from the 12th century. Made in Sicily by the finest Arabic masters of the day. Notice the Arabic writing on the mantle. 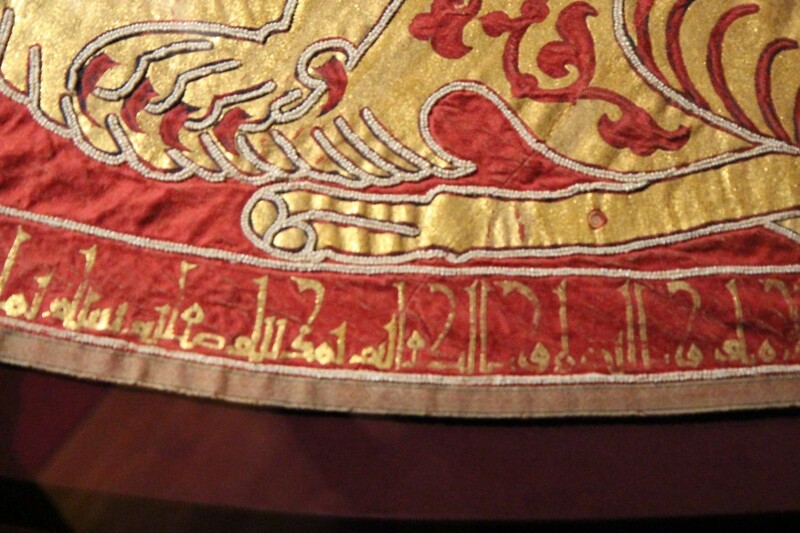 Incredible to be looking at finely wrought, 900-year-old fabric. 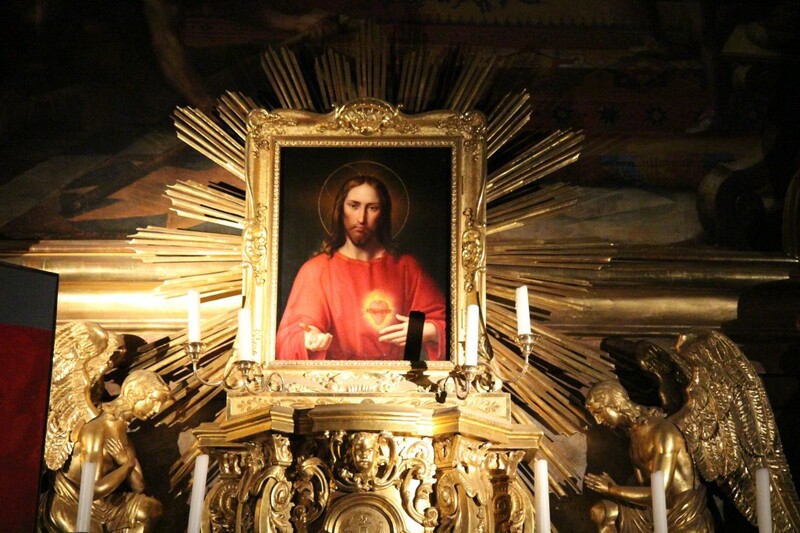 There were so many other treasures and relics that one just runs out of time to see them, photograph them or write about them here. On the school front, Lisa has been hard at work teaching the kids for weeks now. To prepare for Vienna, she had the great idea to study the composers so we’ve found a great app and are learning about their lives and music. We plan to take in another concert soon. Note our mobile maps on the wall behind that beautiful teacher. 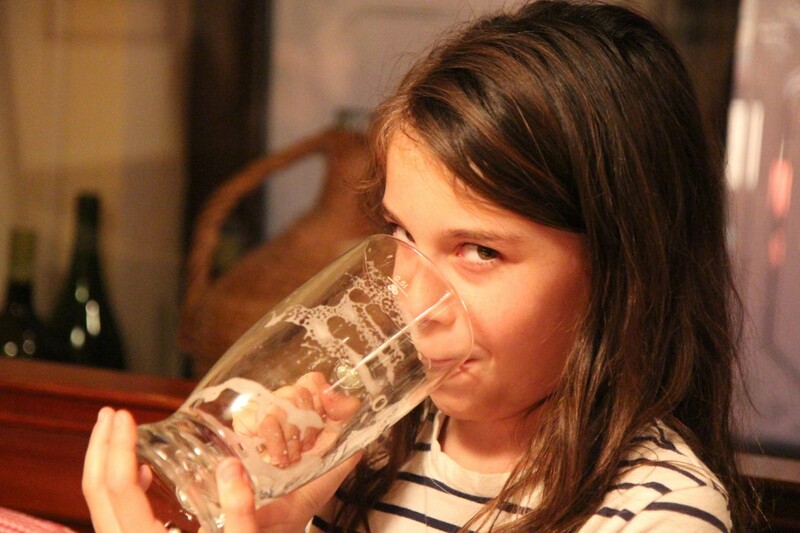 Ana, while in Bavaria, staying focused. It is quite different to be enjoying the city life compared to sleepy Bavaria. Each time we return to our 3rd floor apartment Lisa nearly pushes the kids off the street and into the safety of our locked apartment building door. It makes sense. Our place looks out onto a courtyard of seven story apartment buildings. The wi-fi is better. 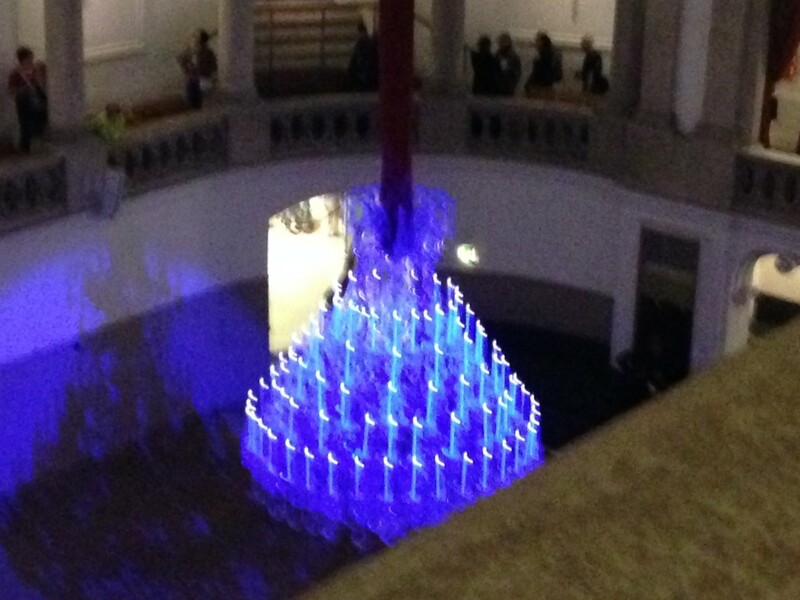 One night late, a “boom” goes off in the courtyard. With our open windows, we feel it. Luke, still wake, runs into our room with wide eyes. People peer out their windows all across the courtyard. It is unclear if it was something heavy being dropped off a building, a gunshot, a car backfiring, who knows. Luke is convinced it was a gunshot. Ah, the city life. I’ve been so blessed to be able to spend time many mornings going through the book of Proverbs with the kids. 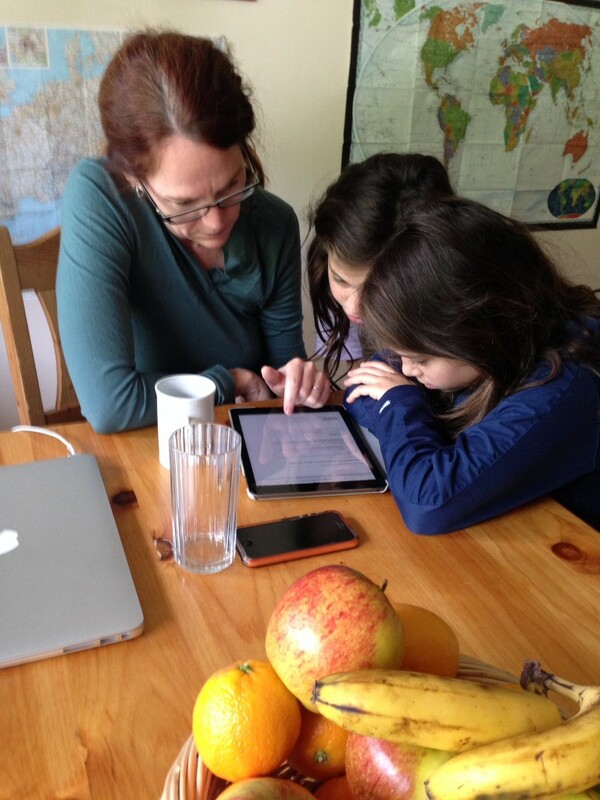 After breakfast and before their school day, we sit at the table and read and talk through the Proverbs. Finally, even I’ve noticed that it is best to tackle no more than 7-9 verses in a morning. We have wonderful, wide-ranging discussions and I think I may be learning more than they are. Their minds seem so open to the contrasting paths of this challenging wisdom literature. This is something I’ve wanted to do for some time now, and it is more rewarding than I’d imagined. I am sure I am learning alongside them. God is good! Don’t get me wrong, often times we are just trying to plan that day’s afternoon! 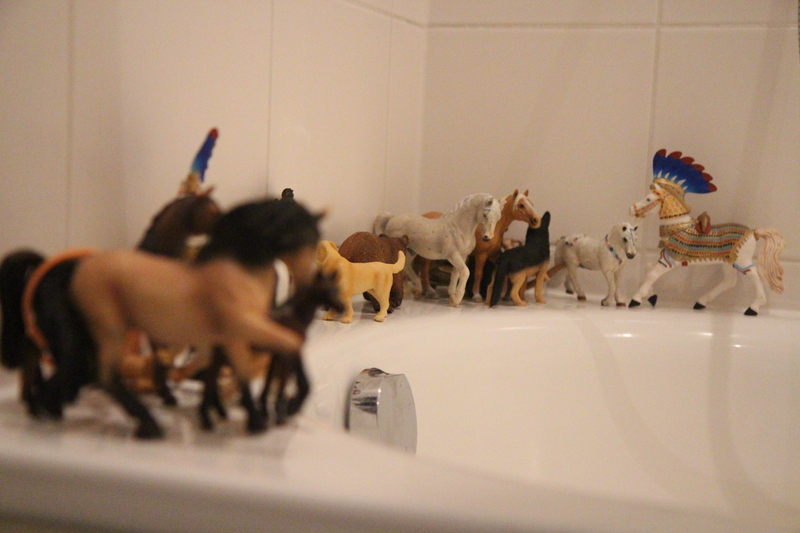 Sometimes, you just have to get in the bath and play with some animals! Don’t worry, they’re not all mine. 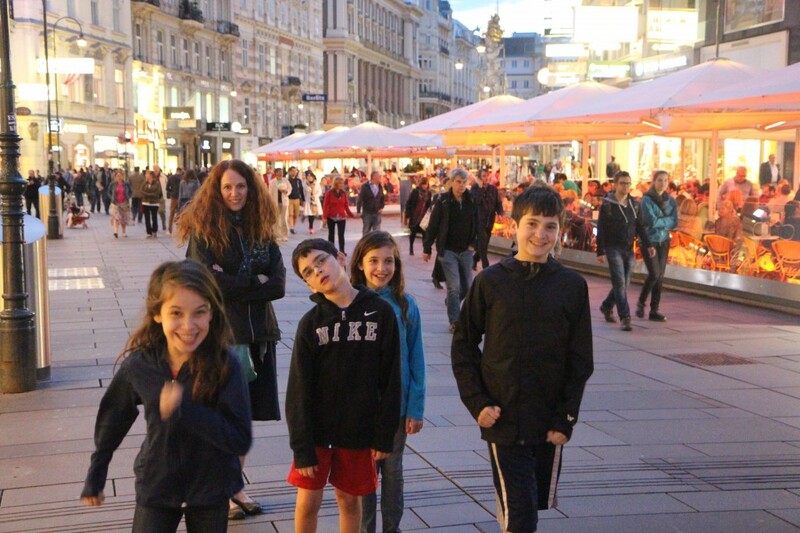 Vienna, you are a walker-friendly city of delights. Pronounced Wien (“Veen”) in German, this city has been considered the eastern frontier of “Western” Europe. Situated on the Danube, its prime location has brought it a lot of attention through its 2,500 year history. The city was threatened during Roman times by Germanic invaders and by Magyars (Hungarians) in the 10th century. Mongols in the 13th century. Hungarians in 1485. The Ottomans besieged and attacked in 1529, then again in 1683 after a two-month siege. Nearly 200,000 Ottomans were repelled in those battles. 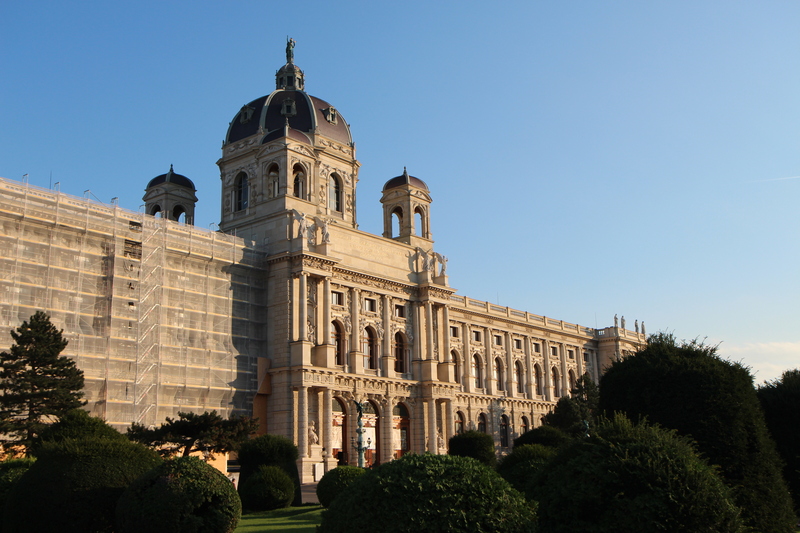 In the 19th century, the Hapsburgs ruled during Vienna’s glory days. The Soviets captured the city in 1945. Somehow this city has remained intact and fascinating. This grand city reigned 640 years as the head of the influential Austro-Hungarian empire. Not accidentally, the most impressive buildings were constructed after the Ottoman threat had faded. 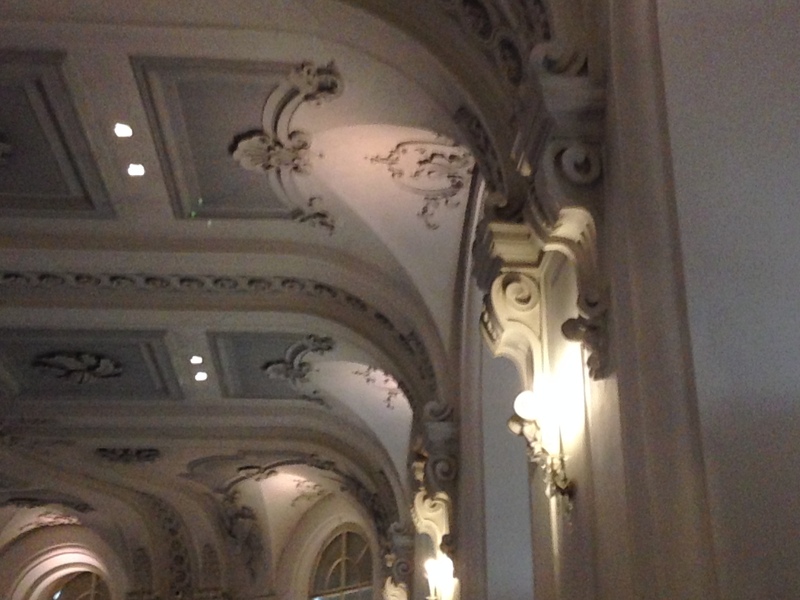 Classical music is still everywhere here. You hear it on the streets and in coffee houses. Salesmen in powdered-wigs pitch their respective concerts in front of every tourist site. It is a city of culture. Among other great artists and thinkers, Vienna was home to Beethoven, Mozart, Schubert, Strauss, Haydn and to philosophers Freud and Gödel. 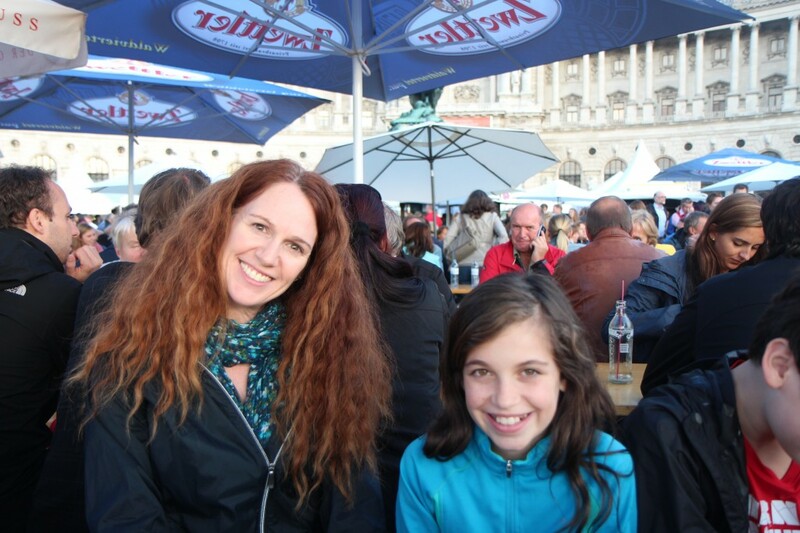 We took the Rick Steves tram tour around the Ringstrasse around the old city. 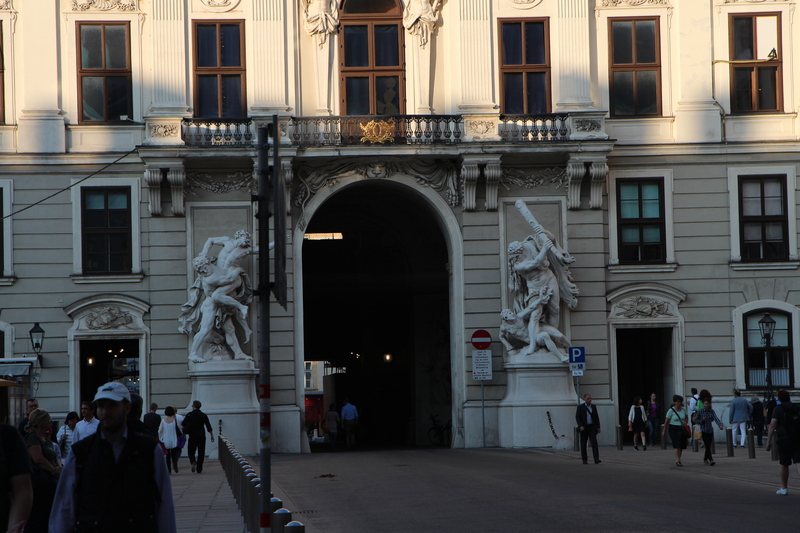 The Ringstrasse is the old city wall that was torn down to make way for a wide thoroughfare. A ruler created these wide streets as a way to prevent any potential revolutionaries from being able to barricade off city streets as they had in Paris during the French Revolution. At least we pedestrians can benefit from that royal paranoia. 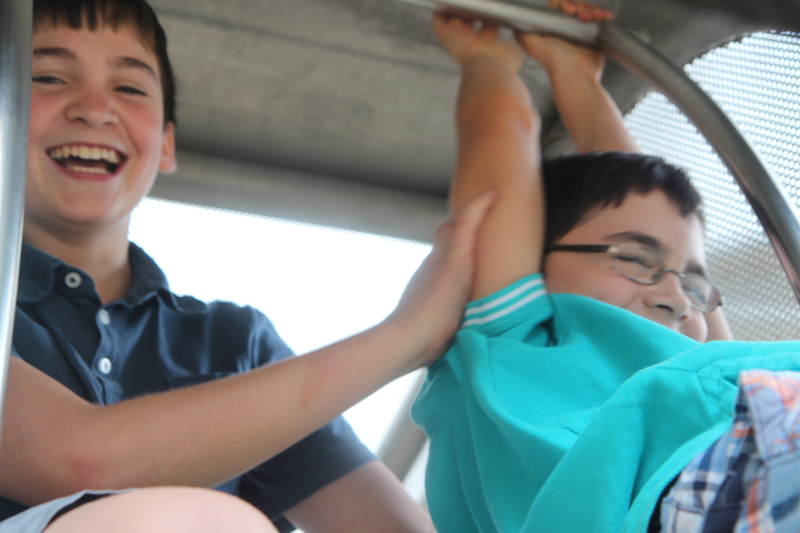 The tram tour quickly introduces you to sights in the old center and the boys loved hearing about the sights from the guidebook then seeing them firsthand moments later. The trams encircle the old city center that is free of skyscrapers and full of pedestrians and parks. I’ve also been amazed at the prevalence of Trip Advisor in Europe. In the States, I’ll look at hotel recommendations on the site but I don’t recall seeing “Trip Advisor recommended” stickers all over their front doors as we do here. Businesses will urge you to review them on the website. If you are looking at things to do in Europe, just look up a particular city in Trip Advisor—you’ll be amazed at the up-to-date “wikipedia” of travelers’ knowledge you find. The opera house was closed the day we tried to get in for a tour but no worries it just gave us more time to enjoy St Stephen’s cathedral (over 450 feet high). 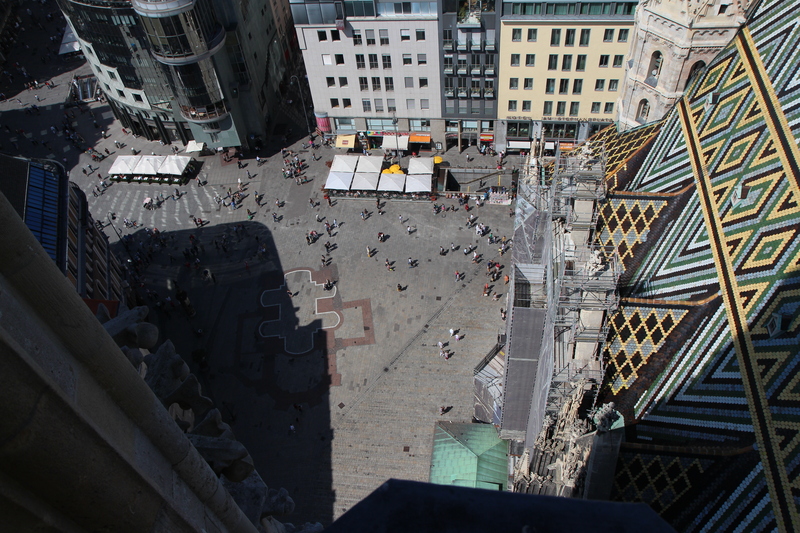 We climbed its South Tower’s 370 steps to get a view. It’s an impossibly narrow climb at some points where you press yourself into the stone to allow people to pass. But none of it stops the souvenir shop at the top! The church here is the third one on this spot and this structure was constructed from 1300 to 1450. 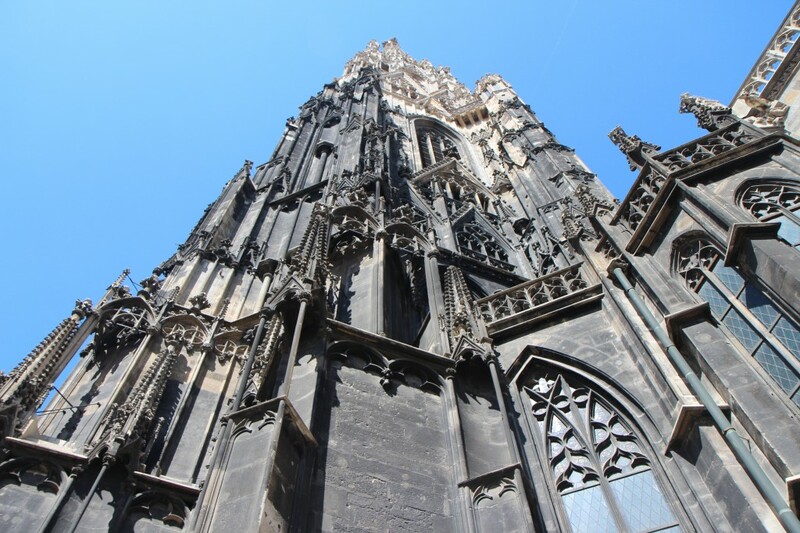 Vienna was only 10,000 people then but the builders were competing with Prague’s St Vittus cathedral. 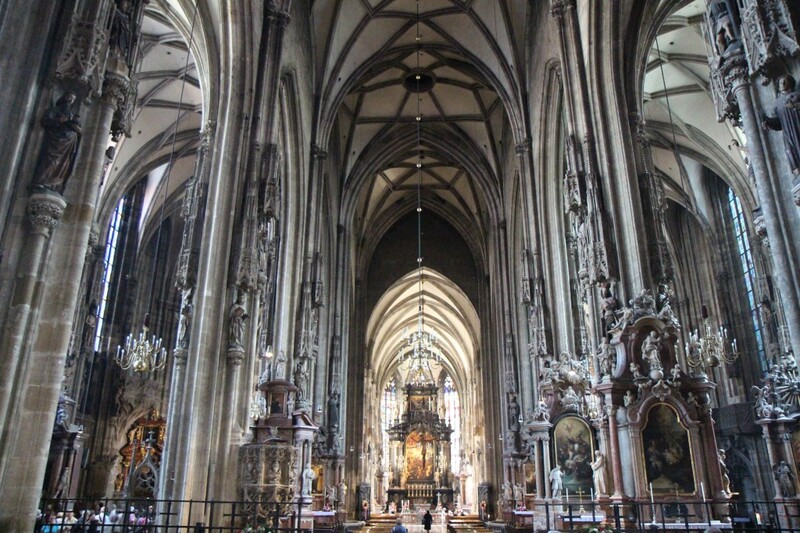 Such a large church (larger than Prague’s) qualifies as a cathedral which helped convince authorities that Vienna ranked a bishop. 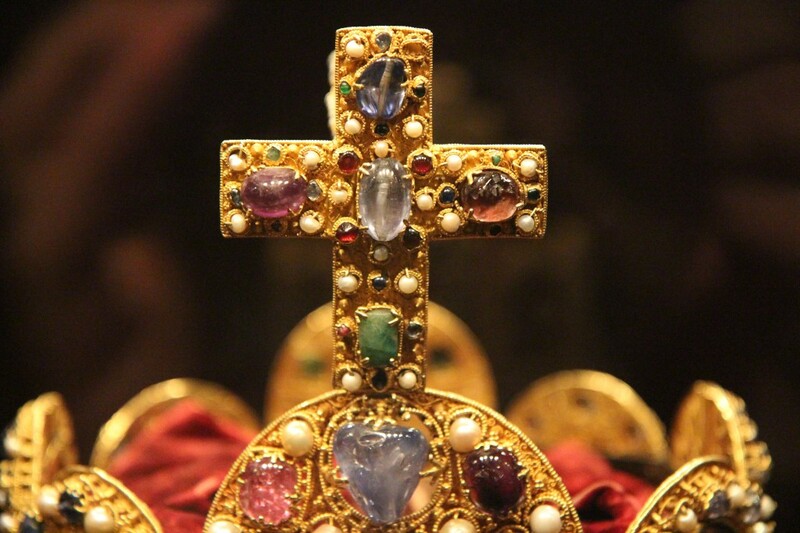 This brought prestige to Vienna and enabled it to replace Prague as the seat of the Holy Roman Empire. The cathedral was heavily damaged in 1945 as the Soviets wrested the city from the Nazis. A fire raged for two days. But the citizens began a financial out-pouring and the roof was rebuilt by 1952. The House of Music gives you an interactive experience through the dynamic musical heritage of Vienna. 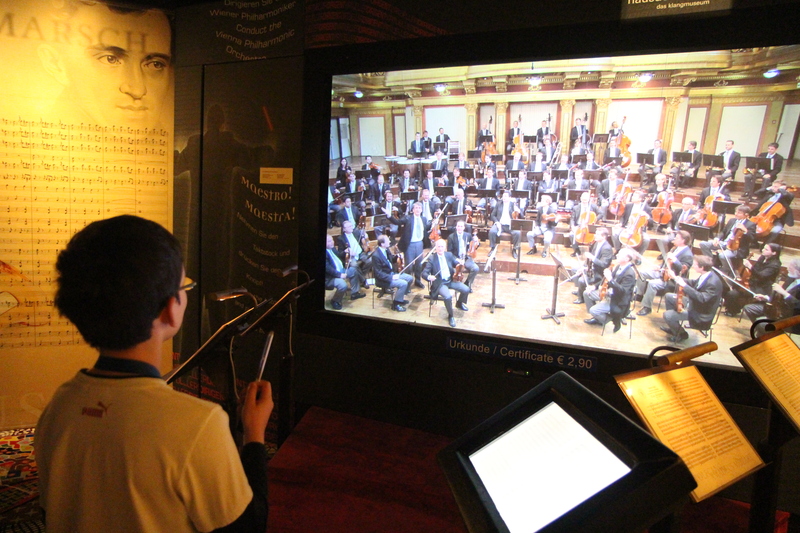 Visitors get the chance to conduct the virtual Vienna Symphony. It is a lot harder than it looks. 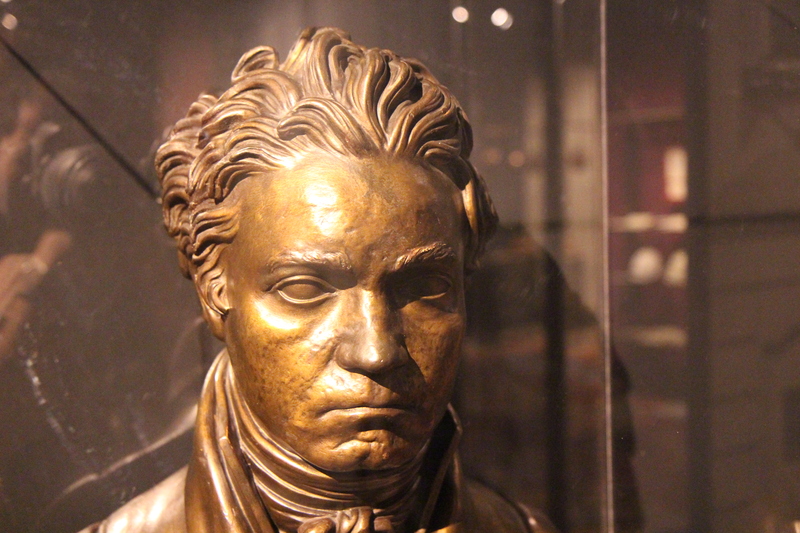 Beethoven (1770-1827) moved over 40 times within Vienna because he was a terrible tenant. Due to his declining hearing, he did end up sawing the legs of his pianos so he could put them on the floor to feel the music. He dedicated a musical piece to Napoleon then tried to rescind the dedication after Napoleon crowned himself Emperor of France. Beethoven even penned the famous love letter to his now-unknown “immortal beloved”. 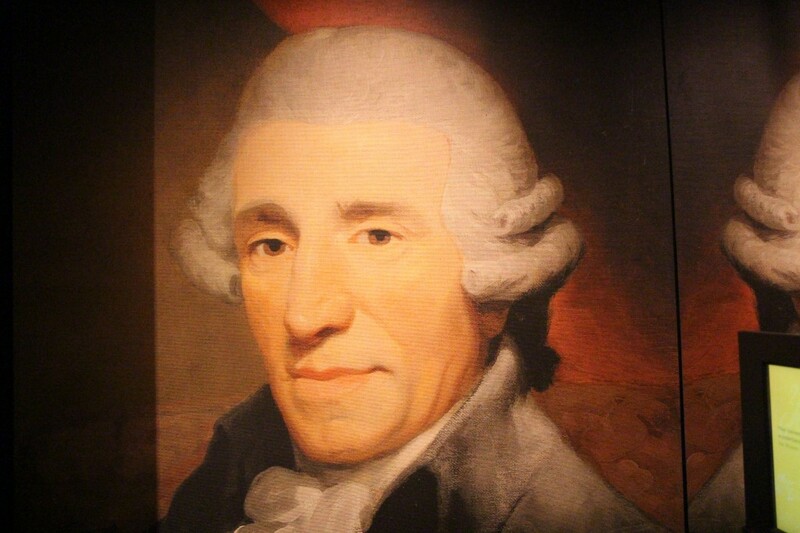 Joseph Haydn (1732-1809) was a friend of Mozart and a teacher of Beethoven’s. He was a prolific court composer and elite customers paid him to write musical pieces on the side. He would sell the same piece to different patrons or make very slight changes to their “original”, personalized musical pieces to increase his revenues. Franz Schubert (1797-1828) always wore glasses, even in bed. His friends thought him funny-looking and quite portly. He did not own a piano, so his friends held parlor parties to be able to hear his genius. Johann Strauss II (1825-1899), the Waltz King, has a golden statue just outside the Ringstrasse in Vienna. He was a rock star in his day and once laid on the floor of a train before a performance and refused to move until securing thousands in fees. 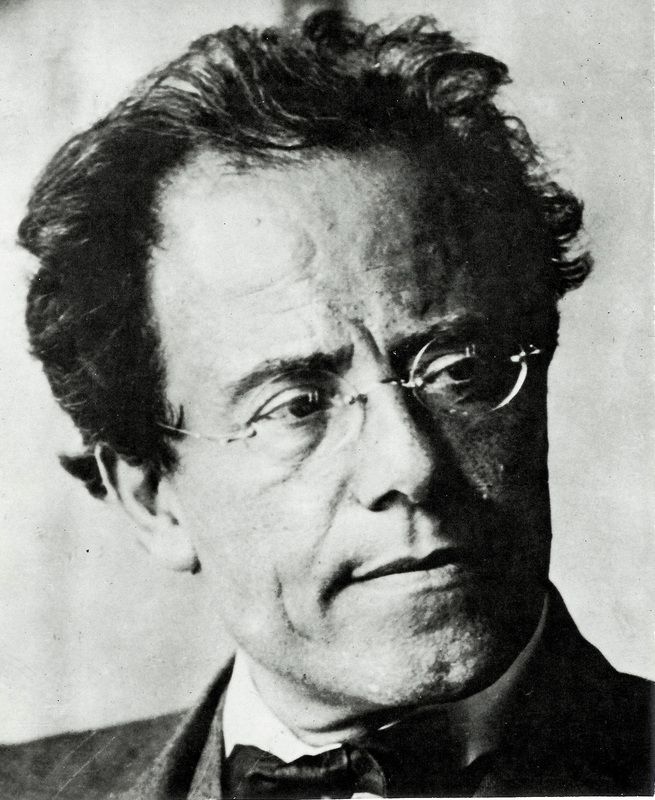 Gustav Mahler (1860-1911) was the conductor of the Vienna Opera for ten years then become so fed up with opera politics that he moved to New York to work there. A Jew, he had endured open hostility and anti-Semitism from the press. 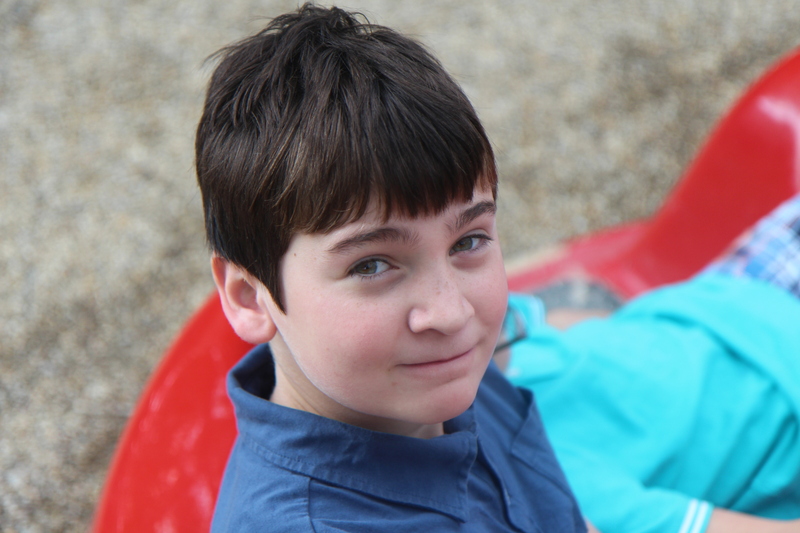 He enjoyed hiking and the outdoors among other hobbies. Each of these famous musicians worked impressively long days teaching, writing, conducting and shoring up financial support. 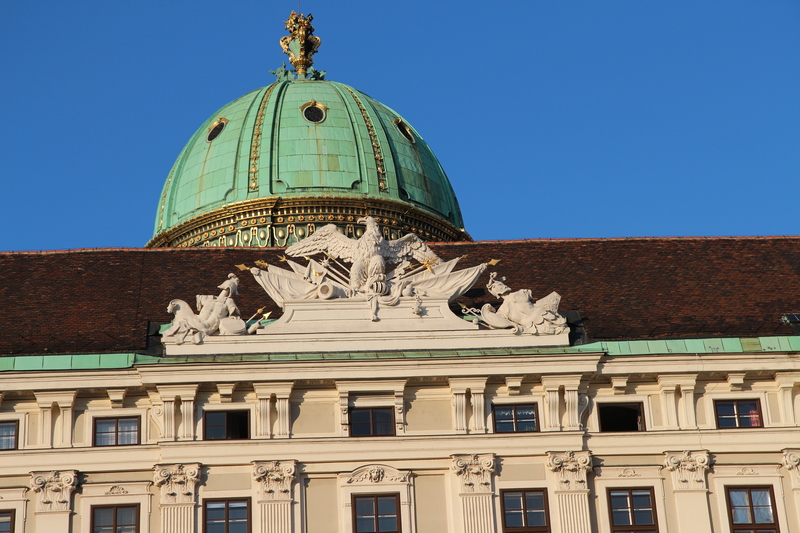 The Graben has many of Vienna’s prime retailers and is near the Spanish Riding School in the Hofburg Palace. Attempting to follow our budget and do our normal picnic lunch, we grabbed lunch at a very upscale (oops) grocer on the Graben. Graben means “ditch” and it was the moat for the Roman military camp back in the day. Later the moat transformed into a three-lane busy street then was torn out in the 1970s to make way for this pedestrian walkway. 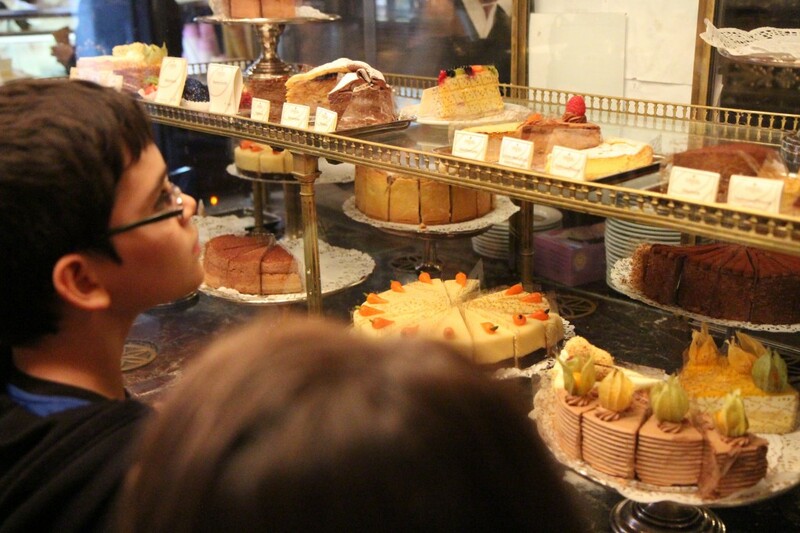 We also picked up a few tasty treats from the Demel bakery. People jostle for views of the delights in the bustling bakery window. I attempted to order a few items and one of the busy ladies behind the counter asked me if it was for the children. This surprised me. Then she explained they were alcoholic—I adjusted my choices. 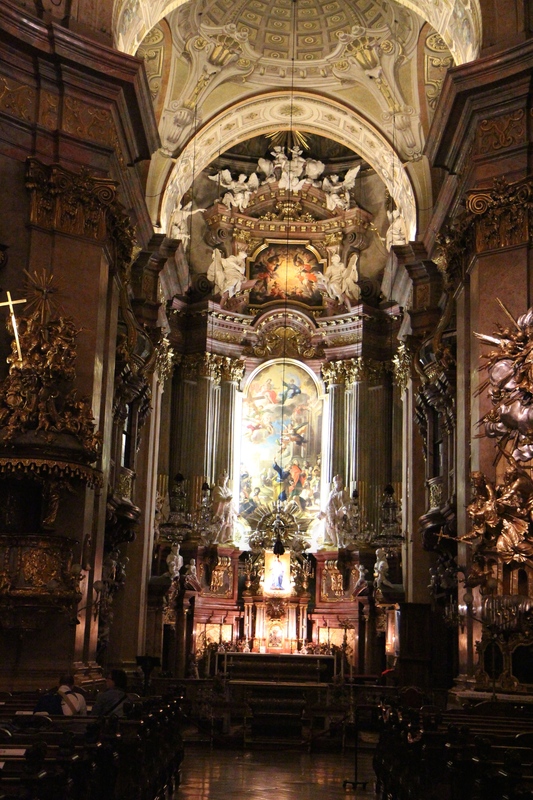 Just off the Graben, we took in a free organ concert at the striking St Peter’s baroque church. We walked in as quietly as elementary-school possible but the wooden pews creaked as we eased into them. The organist and trumpet player played from high and behind us in the organ loft as we faced the altar. The stunning bronze sculpture below displays St John Nepomuk at the point of no return as he is thrown to his death from a bridge. 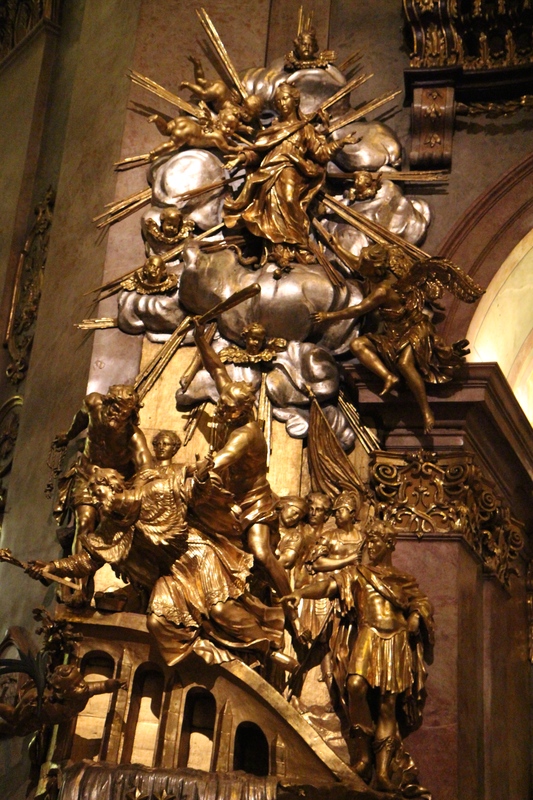 A Czech priest, St John had defied King Wenceslas so he was tossed from the Charles Bridge in Prague. He had taken the confession of the queen and would not relent to the king’s demands that he reveal the sins she’d confessed. If you look at the picture you can see the clubs of the men as they beat St John. Another day we enjoyed a local festival full of food and a tasty beer. Walking back to our tram one night, our route was blocked by this scene of streets blocked off and onlookers piled up against the barriers. 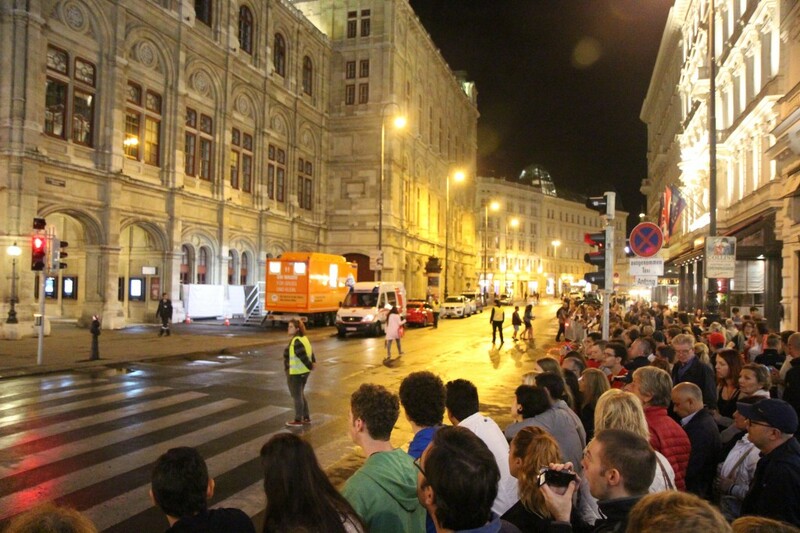 The Mission Impossible 5 crew was filming in Vienna. 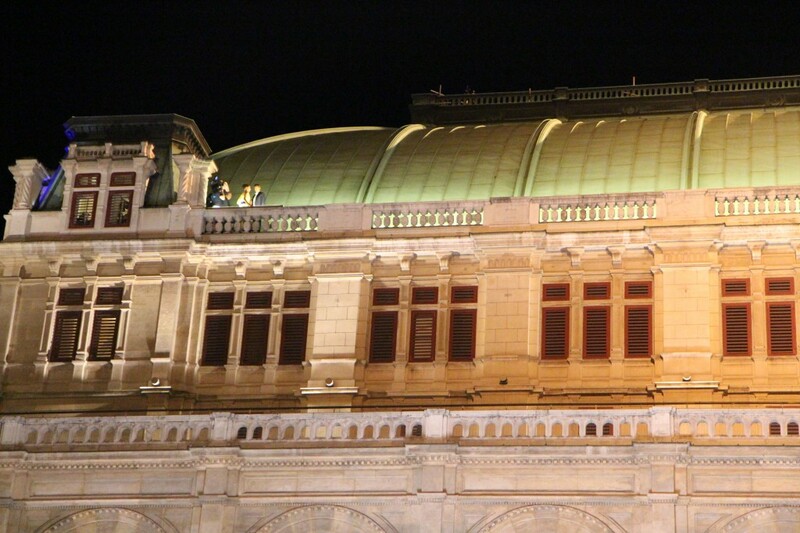 We could even see Tom Cruise and his costar up on the Vienna Opera House roof. 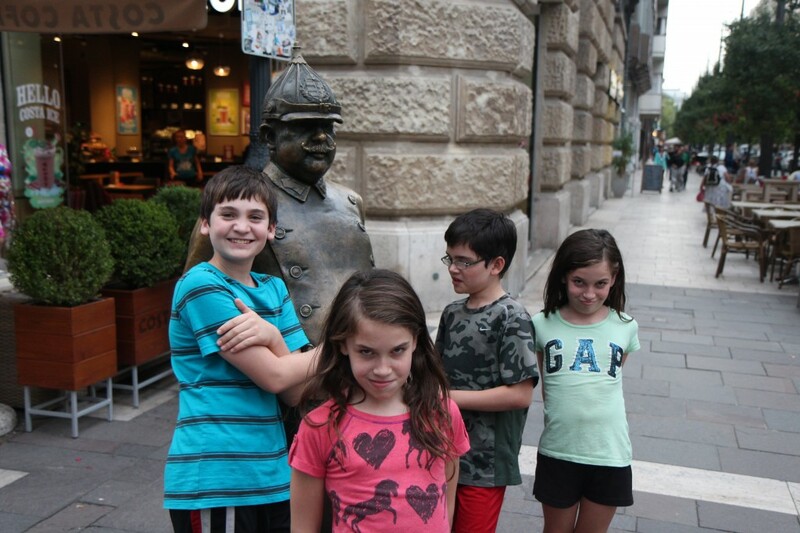 Of course, our kids would have been far more impressed had it been Rick Steves. I’m not sure they’ve seen much of Tom Cruise on the screen. We are really going to have to keep our travel plans under tighter wraps because we’ve read the MI5 crew is also going to London to film. They must be following us. 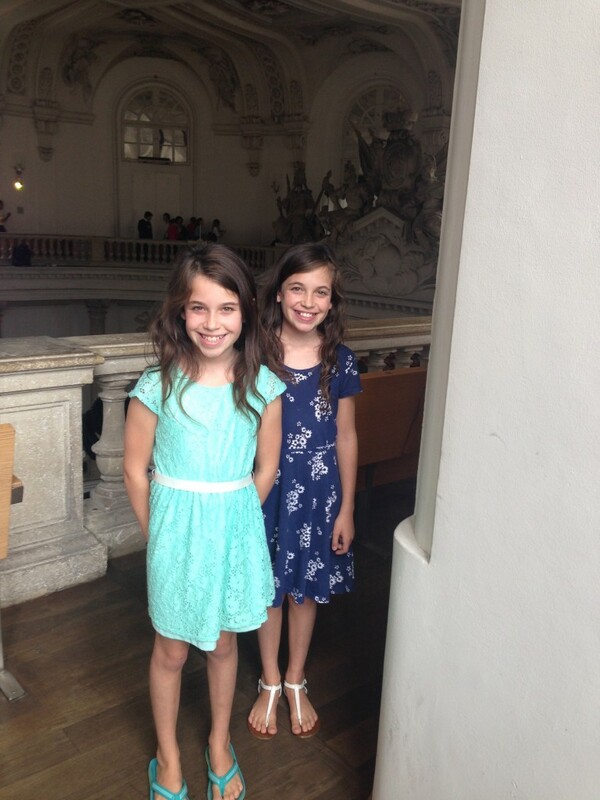 Vienna has also been great for us because we are working on our German skills. I am better now at communicating to any deli lady which meats and cheeses I want. That probably really means I point even more emphatically and grunt even louder. Lisa found the Germanized series on YouTube and we are also podcasting “Coffee Break German”. The Mesquits can often be found driving around Europe and practicing phrases like, “Wie geht es?” and “Ich heiße Camille”. They make Coffee Break French and Spanish and who knows how many other languages. 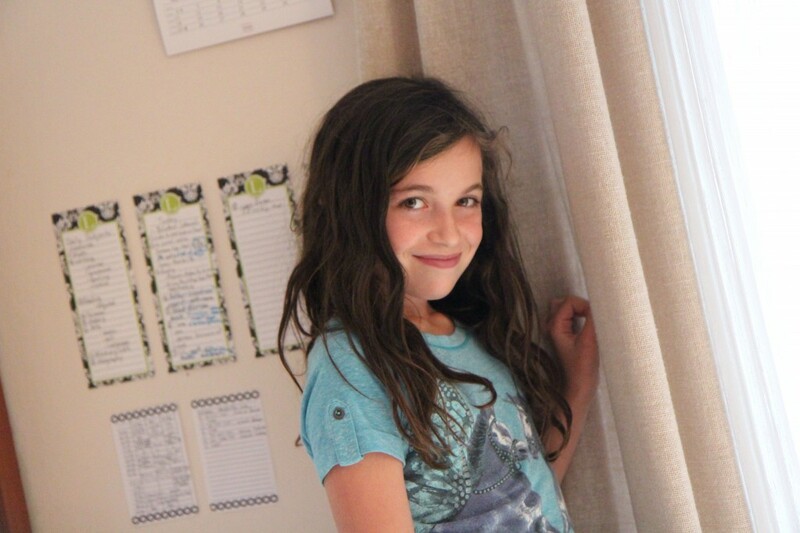 We also love us some Adventures in Odyssey podcasts. Our entry in the contest for longest word in the German language! If you were a Habsburg this was your vacation house. Schönbrunn palace was originally a “hunting lodge”. 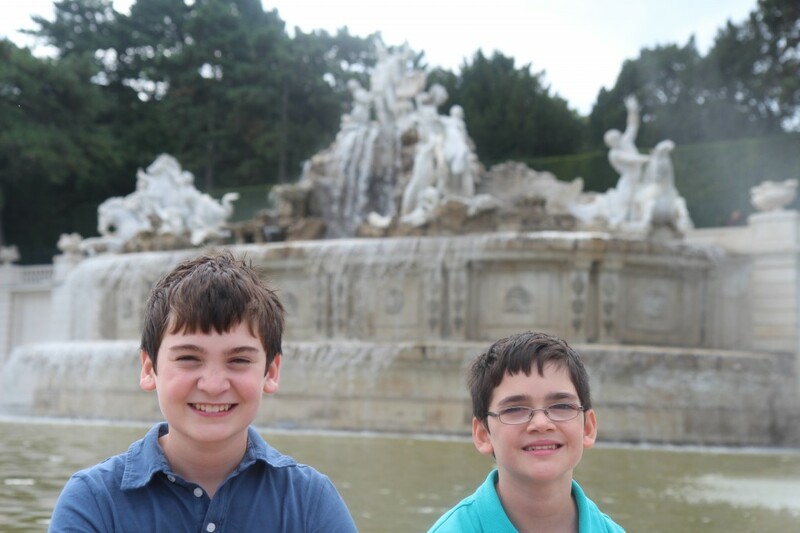 The family escaped the summer heat of Vienna by horse-drawn carriage and traveled the ten miles or so out to this estate. 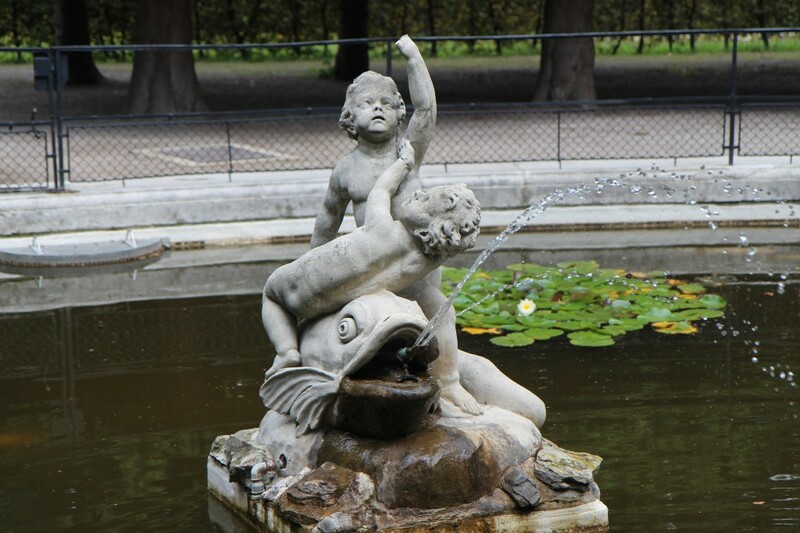 First acquired in 1569 by the Holy Roman Emperor Maximilian II (a Habsburg), the family built upon the existing mansion already there. By 1640, the palace was being referred to as Schönbrunn . The young Marie Antionette (a Habsburg) spent time here in the mid-1700’s before marrying the future King of France. Its apartments are exquisitely designed with interior courtyards to allow sunlight into the inner rooms where the royal family lived and worked. 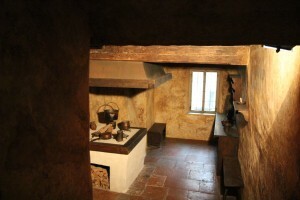 Servants hustled about in narrow corridors between the walls to keep the fires stoked in the backside of ceramic fireplaces. Nobility would arrive by carriage to the grand entrance and be whisked up the double staircases into the hall. Here, dances and banquets were held and the empire’s elites were seen. In 1867, the Austro-Hungarian empire was formed when the Habsburg family successfully negotiated the addition of the Kingdom of Hungary to the Empire of Austria. The empire was the second-largest country in Europe (after the Russian Empire) and the third-most populous (after Russia and the German Empire). At its zenith, it controlled the countries that bear its name and much of Poland, Italy, Czech Republic, Romania, Serbia, Ukraine, and on and on among smaller nations. Its last significant Habsburg, Emperor Franz Jospeh I, ruled from 1850 to 1916—sixty-six years. His wife, Elisabeth (known as “Sisi”), was beloved in the great capital of Vienna and the city still bears her image everywhere. She is famous for carefully exercising and dieting to take care of herself and for her hair that reached well past her corseted, 16-inch waist. She tried not to allow her image to be painted or captured after age 30 as she wanted to be remembered as always young. Franz Joseph took his duties very seriously and worked 12-16 hours a day, with an eye for administrative minutiae. He slept in a spare, “soldier’s bed” and considered himself, like a member of the Empire’s military, to be on duty at all times. Franz Joseph lost his only son to a murder-suicide with a mistress in 1889. Then he lost his wife Sisi to a political assassination in Geneva by an Italian anarchist in 1898. His brother Karl Ludwig had died from drinking contaminated water. 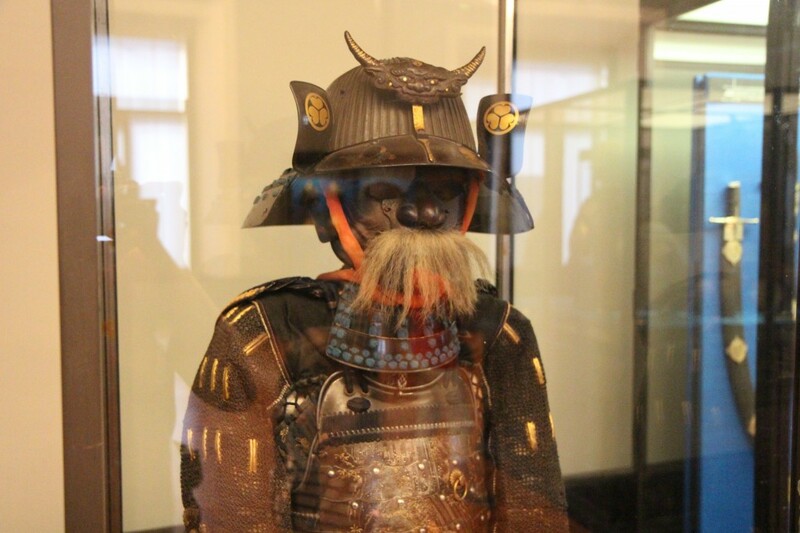 His surviving brother, Maximilian, was executed in 1867 by a Mexican firing squad after unsuccessful three-year-stint as that nation’s emperor. This left the Empire’s heir as Karl Ludwig’s son, Archduke Franz Ferdinand. It was Franz Ferdinand who was assassinated in June 1914 in Sarajevo by a Bosnian Serb nationalist. Nationalists there protested the influence of the Empire over their nation. 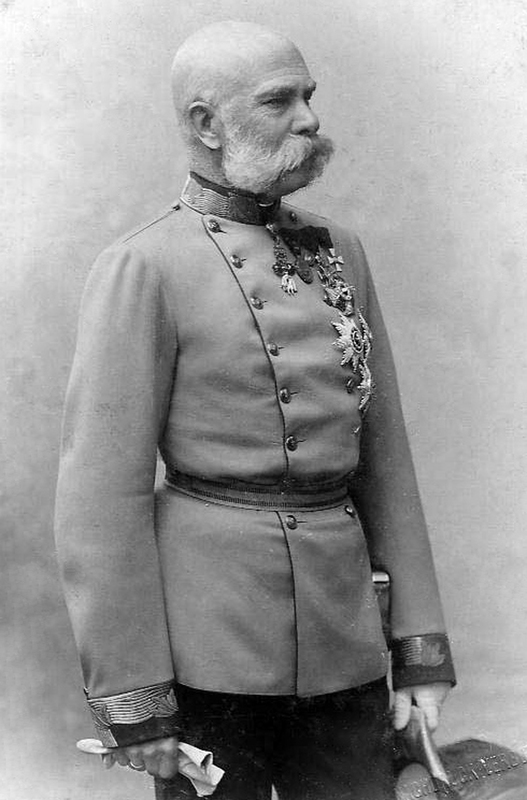 Franz Jospeh followed the counsel of his advisers and took a hard-line approach toward Serbia, setting off the chain of events that led to WWI. You can still see the desk where Franz Joseph was working in the evening trying to catch up on work he’d missed while ill with pneumonia. 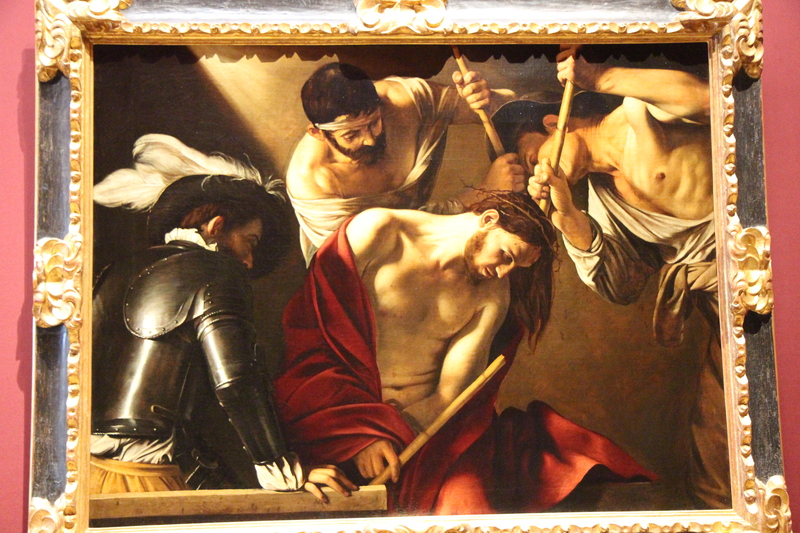 He went to lay down on his cot and told his servant to get him up in a few hours to continue his work. He did not make it back to his desk that night. He was 86 years old. Two years later, WWI ended. Austria had been on the losing side of the Great War, and the Austro-Hungarian Empire was dissolved. Franz Joseph’s successor, his great-grandnephew, resigned his constitutional powers at the Armistice in 1918. He tried to regain his throne a few months later and was exiled. The Austrians, unlike the English, do not seem to relish their royal family. The family was banished from Austria immediately after WWI. 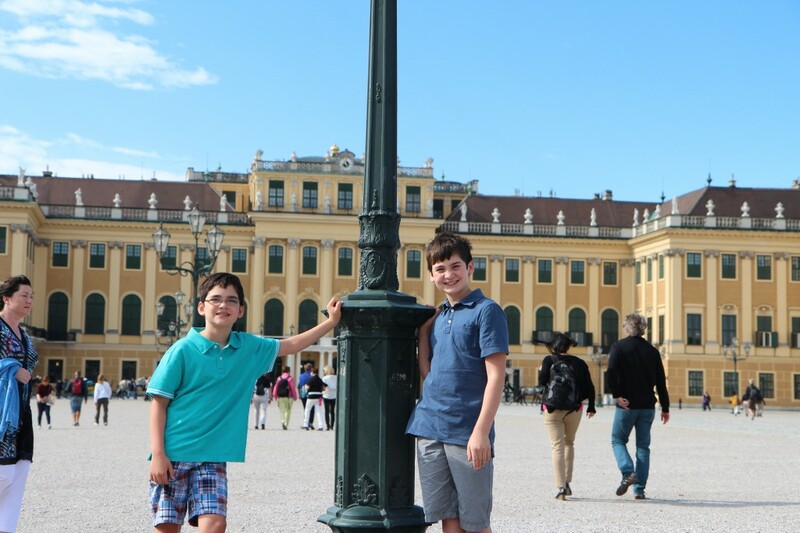 The last heir to the Austro-Hungarian Empire, Otto von Habsburg, was nine years old in 1922 when his father passed away and young Otto became the head of the House of Habsburg. Even though he was never a ruling monarch, he renounced any claim to the crown in 1961. Only five years after that did the Austrians let him back into the country. However, his passing in 2011 at age 98 prompted a state funeral in Vienna. 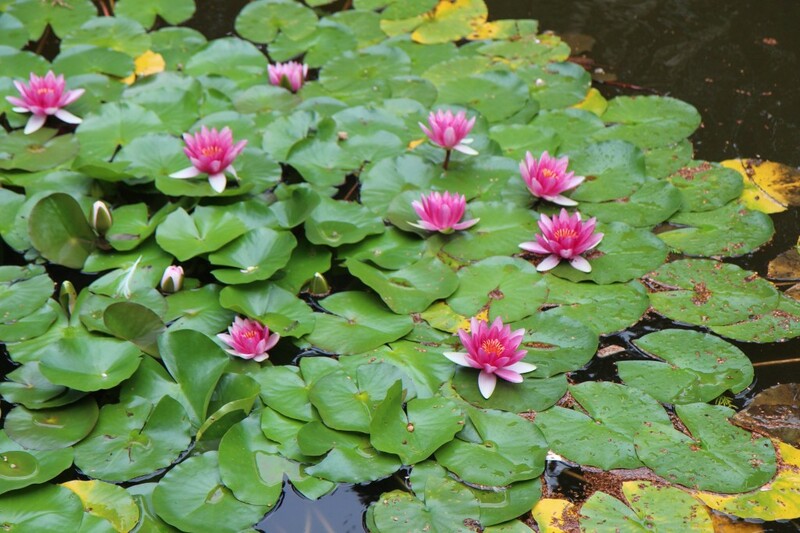 The Habsburg family traces its roots back to the 11th century. One facet of their legacy is the enriching cultural legacy they’ve left Vienna. A Habsburg held the position of Holy Roman Emperor nearly continuously from 1452 until the dissolution of the Empire due to its defeat by Napoleon in 1806. And we get riled up when nearly any administration overstays its welcome at eight years! The Habsburgs were one of those influential houses whose descendants reached into the royal families of all Europe. 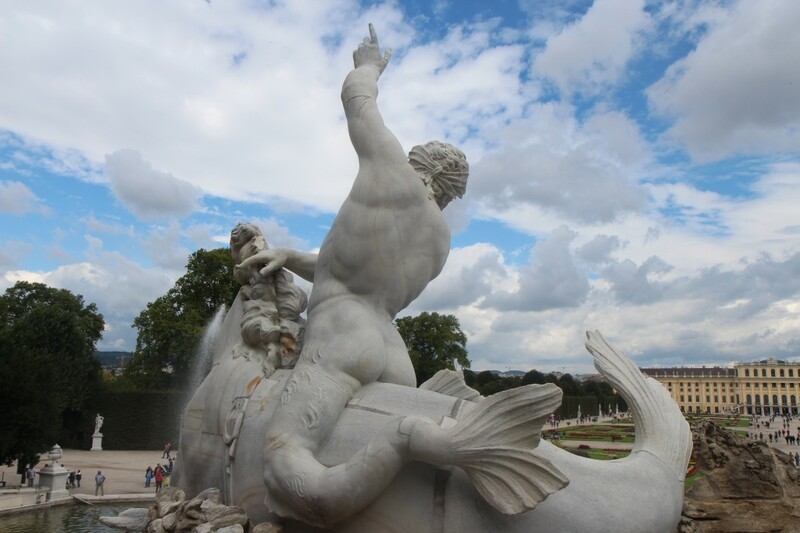 UNESCO placed the Schönbrunn palace on its World Heritage List in 1996, as a magnificent example of Baroque architecture and gardens. Now, certain municipal officials are allowed to live in rent-controlled palace apartments here. 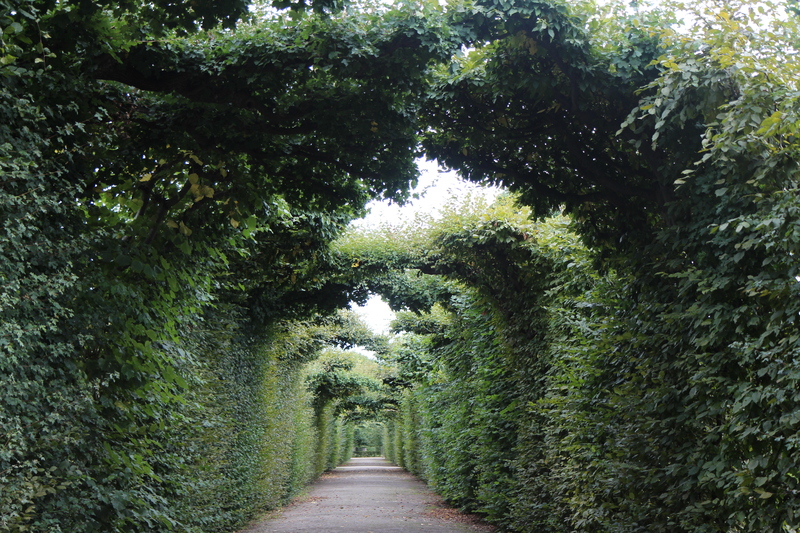 The grounds were opened up to the public over two hundred years ago. 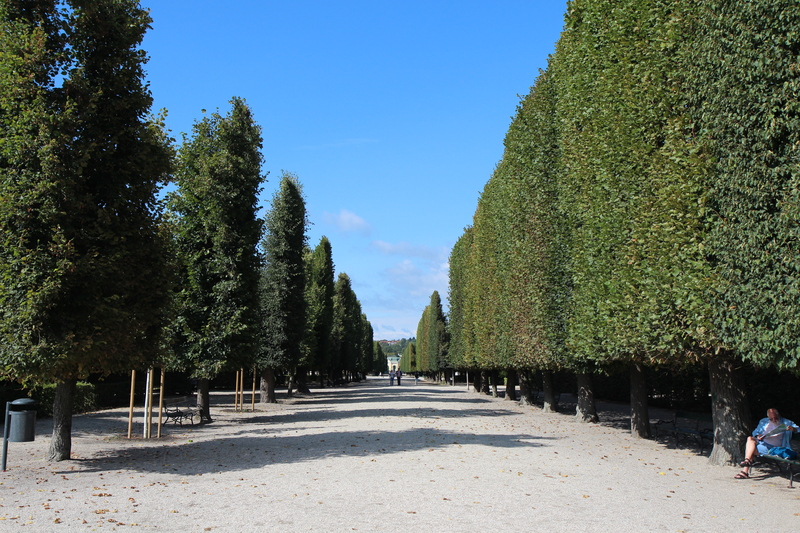 You could easily get lost amongst the geometric rows of sculpted trees and local runners bouncing past. 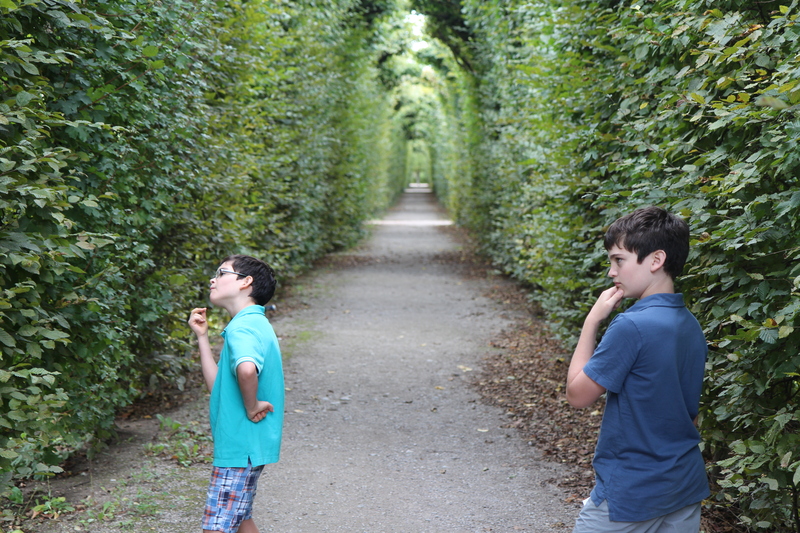 The grounds hold a zoo, private gardens and a children’s playground and hedge maze. 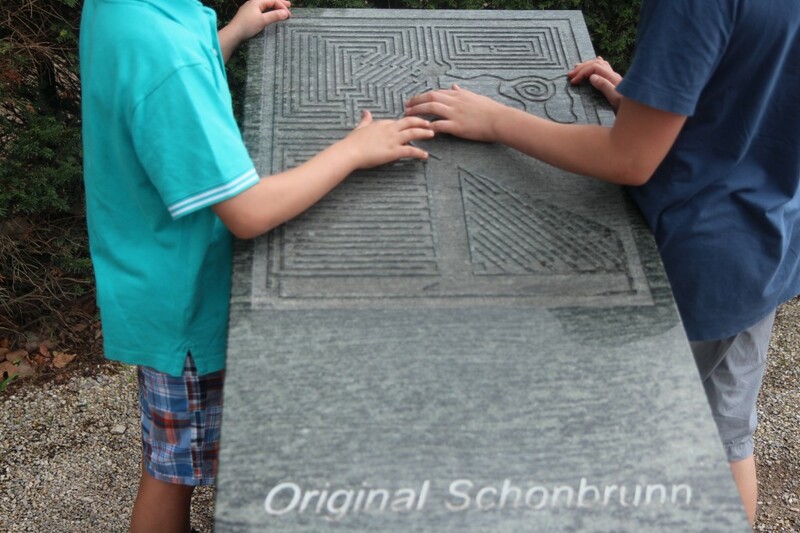 You can stomp out melodies, hurry past “surprise” water jets, shimmy up climbing poles and race your siblings through the maze. 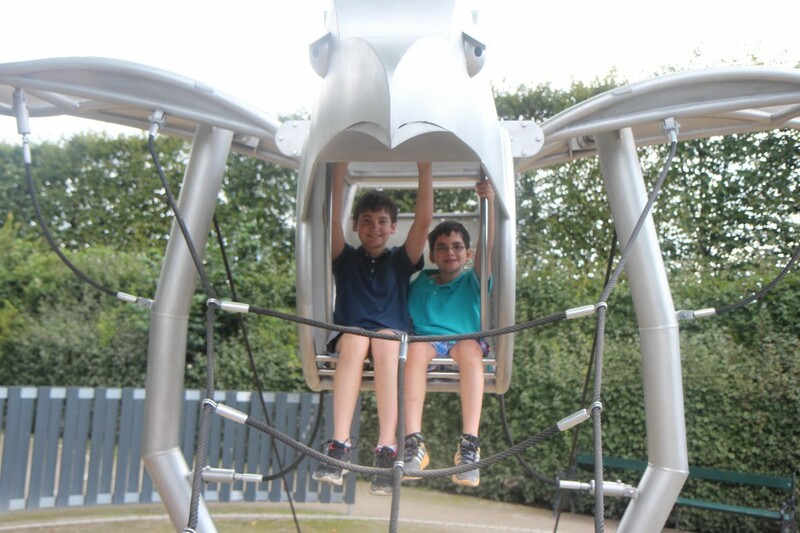 A viewing platform up top holds parents and the birds-eye view of direction-givers. 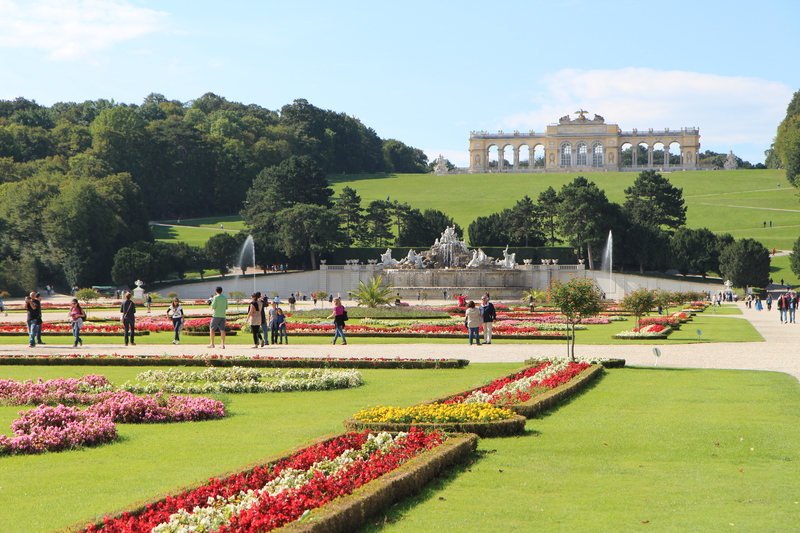 We did a lot of playing and hiked up the hill to the Gloriette Arch with the view of the grounds. 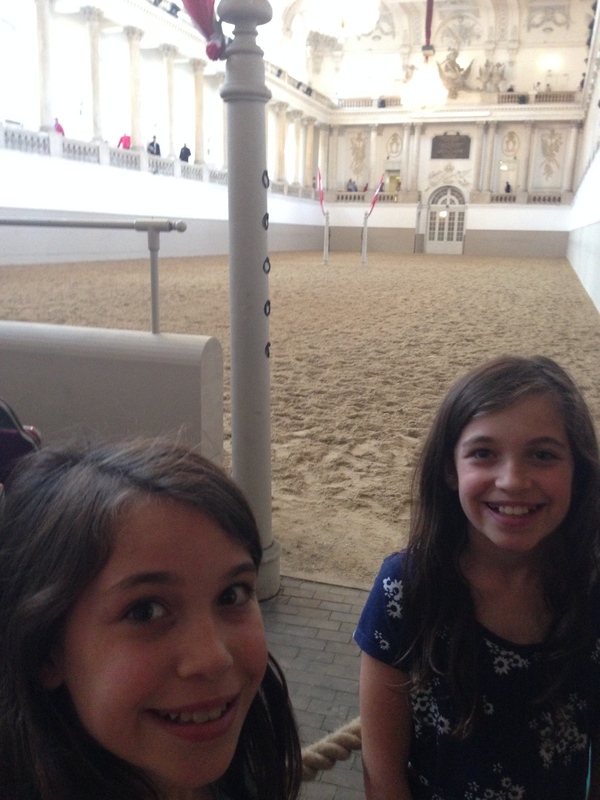 We met the girls after they’d finished their time of joy with the Lippizaners at the Spanish Riding School. 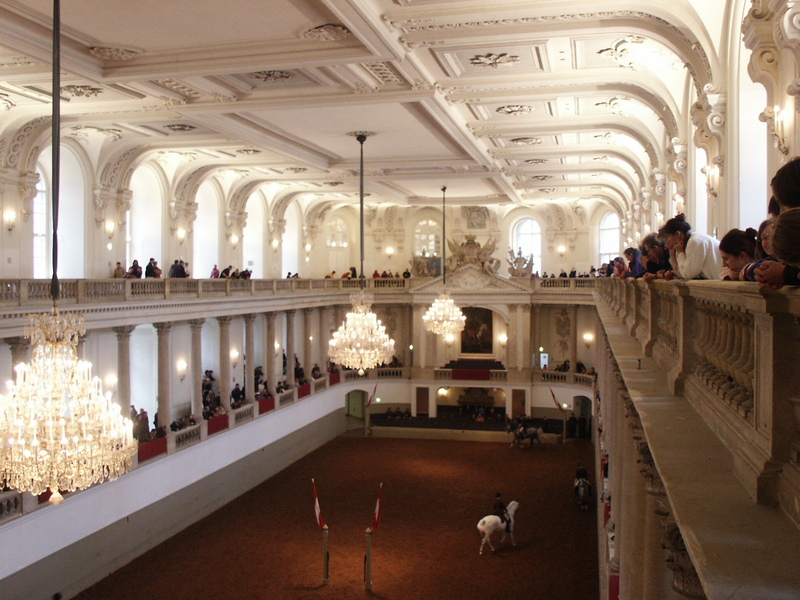 By the way, the entire baroque hall where the horses perform is just one hall of many in the Habsburg’s other palace in the heart of Vienna. We linked up at a classic Viennese cafe for coffee and cake. Vienna is a city that takes its cafes very seriously. 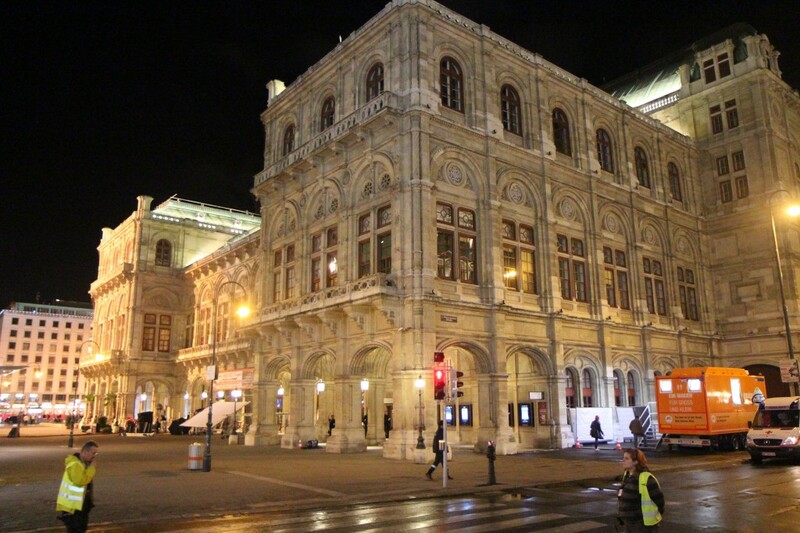 Viennese coffeehouse culture goes back at least 300 years. 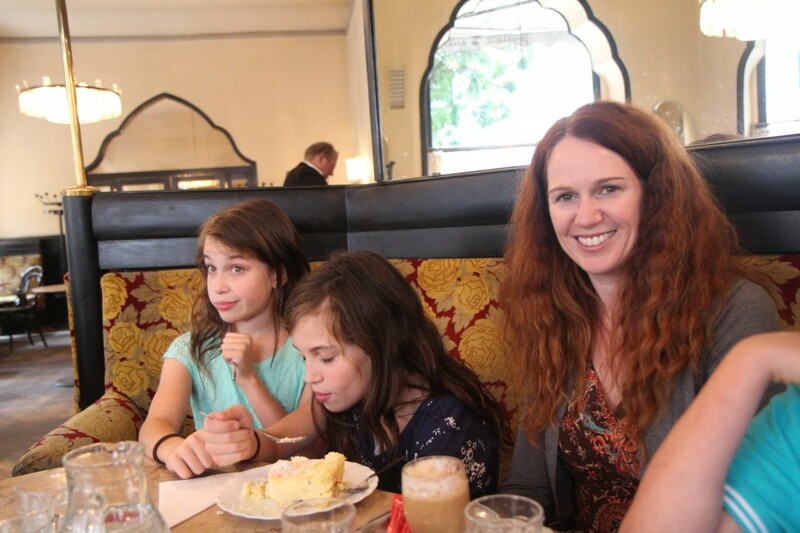 We enjoyed one of the traditional cafes—the Cafe Tirolerhof. The newspapers lay on tables in their wooden holders for easy reading. 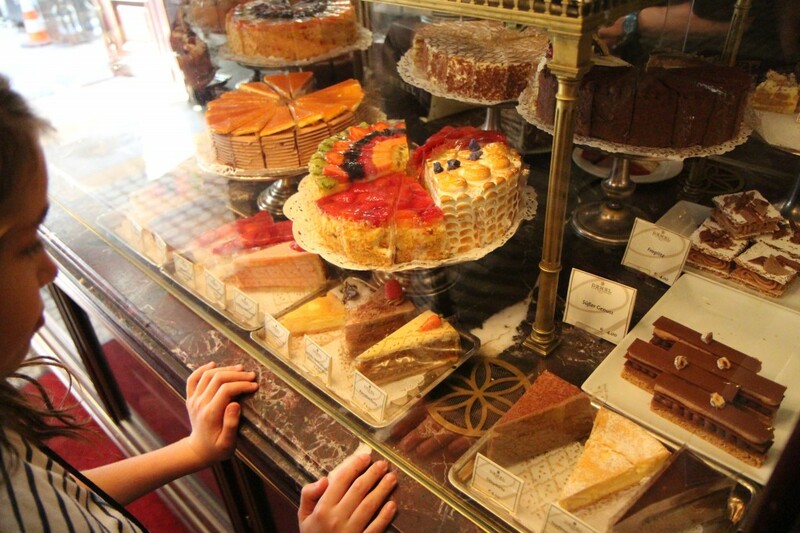 A glass display case presents tantalizing cakes and pastries. The waiters wear long shirt sleeves and jackets. Small pouches emerge at their waists for quickly making change. Ours did not smile much and was all business. The coffee menu is long, and strange. Many of these drinks are found only in Vienna. Coffee, here, is an art form. Apparently, if you order just a “Latte”, you may be taken for an Italian and brought hot milk. A “Melange”, or Verlängerter, is made with hot and foamed milk and dusted with cinnamon or cocoa powder—similar to a cappuccino. The “Kapuziner” is a small black coffee with a bit of Schlagobers (heavy whipped cream) so the coffee takes on the color of a monk’s hood. A “Faiker” is a “Verlängerter with hot milk and served in a glass. 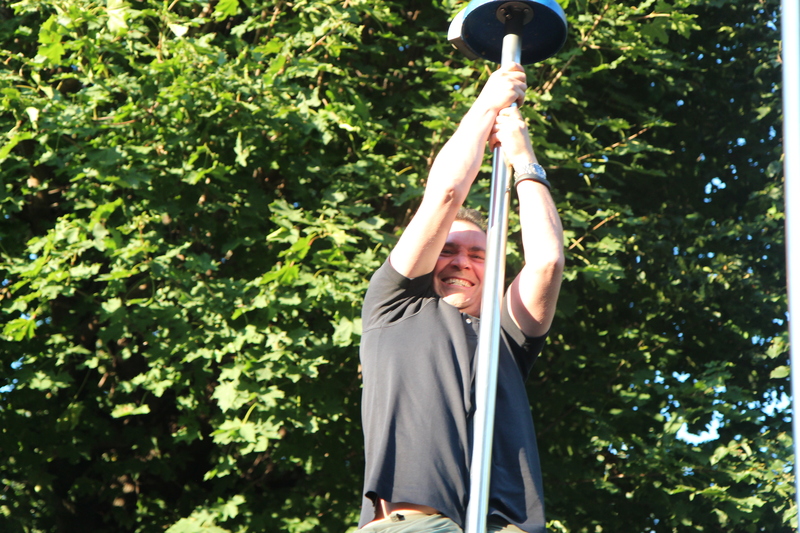 An “Einspänner” is a Faiker with lots of Schlagobers on top and extra sugar for sprinkling. I could go on and on. Apparently, coffee house waiters used to bring out a chart showing various hues of coffee colors—like a paint sample card—so a patron could select their precise shade. The apple strudel was delicious, of course. I ordered something that sounded like a large latte, which the waiter brought in a tall glass without a handle. It was burning-up hot and I couldn’t hoist the beauty for some time. The tiny glass of water they bring with the coffee is a great finish to an afternoon coffee. Everything tasted fabulous. It seems we have a trend here of blog posts involving coffee and/or pastries. When our young waiter brought Will’s hot chocolate, he let the angle of the saucer drop just a bit as he lowered it to the table. Some of the cocoa crept over the edge of the mug and pooled in the saucer. The corners of his mouth turned grim and he used a napkin to wipe out some of the cocoa from the saucer. He couldn’t get it all right away and was likely left with the internal debate of removing the drink completely to reaccomplish or to leave it as is. He left it with us but seemed disgusted about the appearance of the drink he’d failed to deliver adequately. Somehow, Will ended up managing to survive this egregious error in beverage aesthetics. He’s good like that! 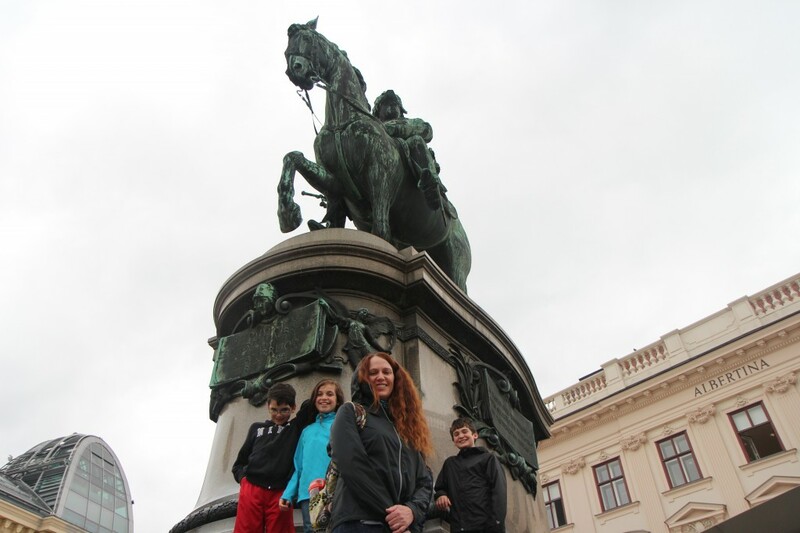 My sister, my Mom and I galloped to the Spanish Riding School of Vienna. After side saddling a subway train, we arrived above ground surrounded by a huge church, horse drawn carriages, and ornate buildings. It was like nothing I had ever seen before! The gothic church of St Stephens towered over the neighboring buildings, with its carefully patterned tiled roof of green, black, aqua, yellow and white. “Hold your horses,” Mom should have joked as we stopped to examine the map. We walked for a few minutes and gladly collected our tickets at Will Call. 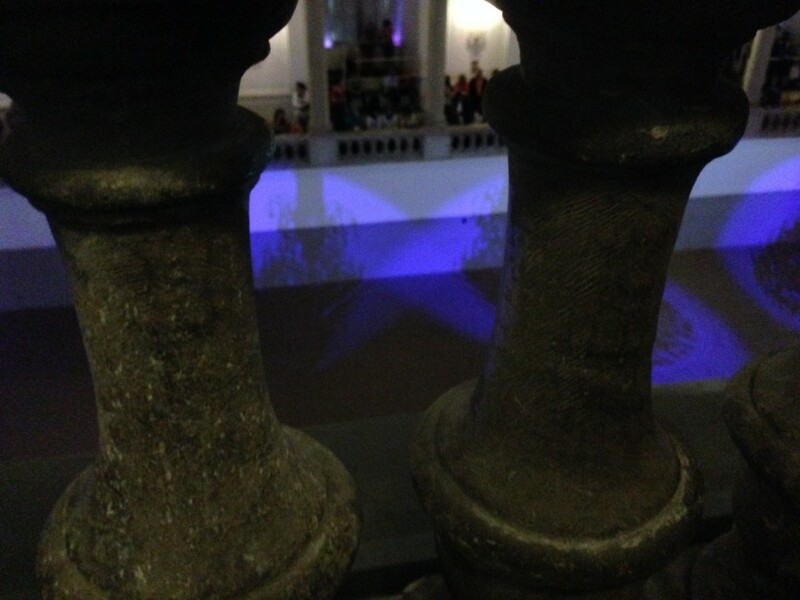 Quickly climbing up two flights of stairs, our seats awaited us in the second gallery. 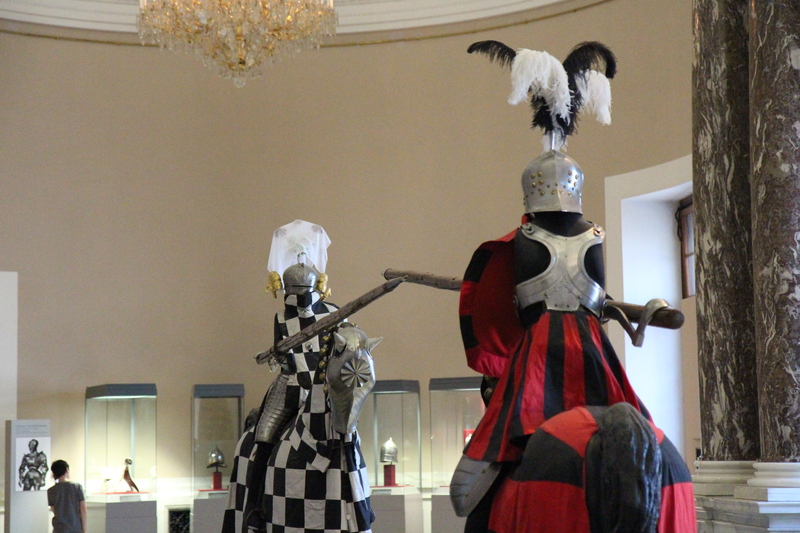 Statues of knights and kings gallantly posed with their swords on either end of the ring. Sitting in our seats and leaning over the wide, chilly, and decorative stone railing, we observed as the enormous blue chandeliers rose up into the air and the first act began. 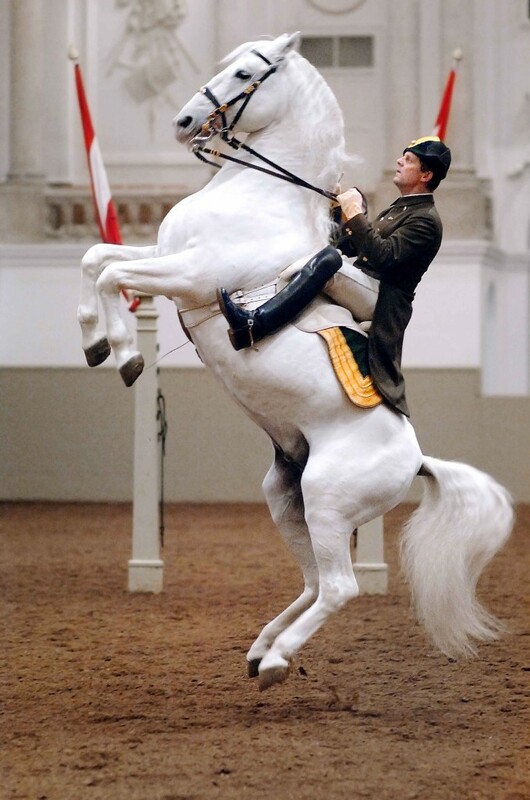 Six young Lipizzaners pranced out of the gate, wearing fancy saddles and reigns. The riders wore identical uniforms and each carried a birch wood crop. The horses did circles and exquisite sidesteps. Then, the second act opened and two horses came out. They did a duet in perfect synchronization. They danced pirouettes and a gait where they picked up their feet to a prance. The next act was most exciting! The regal stallions performed high jumps and reared up with their riders on their backs and bunny hopped on their back legs. The crowd oohed and applauded as each horse took center ring. It was amazing! Then the fourth act started. It was solo. Magnificently controlling the horse with only a switch of his hand, a man appeared with a horse, following behind it, directing with a pair of long reigns that were the length of the horse. The horse cantered and side stepped, like a professional performer. 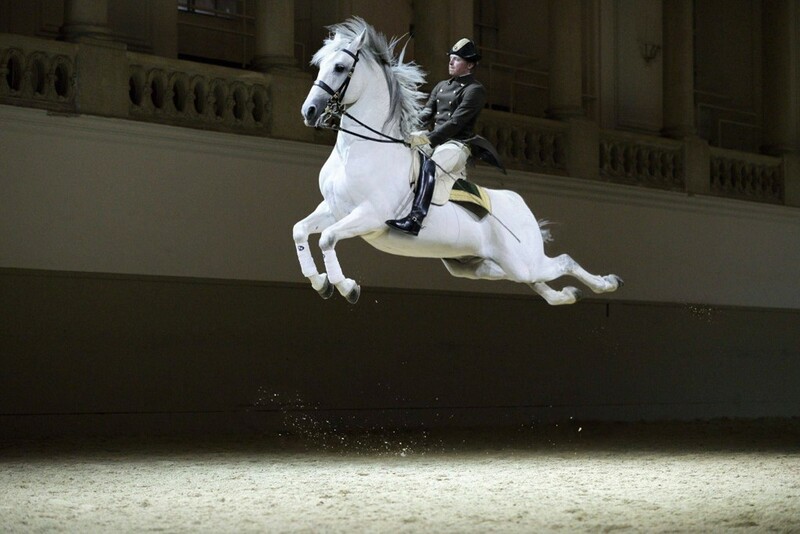 The fifth and last act began with eight Lipizzaners with riders prancing in tidy lines and patterns in unison. As they crossed each new line , I knew it was a experience I would always remember. Spanish Riding School in Vienna was amazing. I had a blast. 1. Find the nearest informational plaque and stand right in front of it. If your siblings can still almost read it, lean on the plaque. 2. Step in front of the interactive touchscreen. Instead of clicking on the “next” screen, drag your finger across the screen and enjoy the cloud that forms behind your finger. Start doing faster and faster loops. 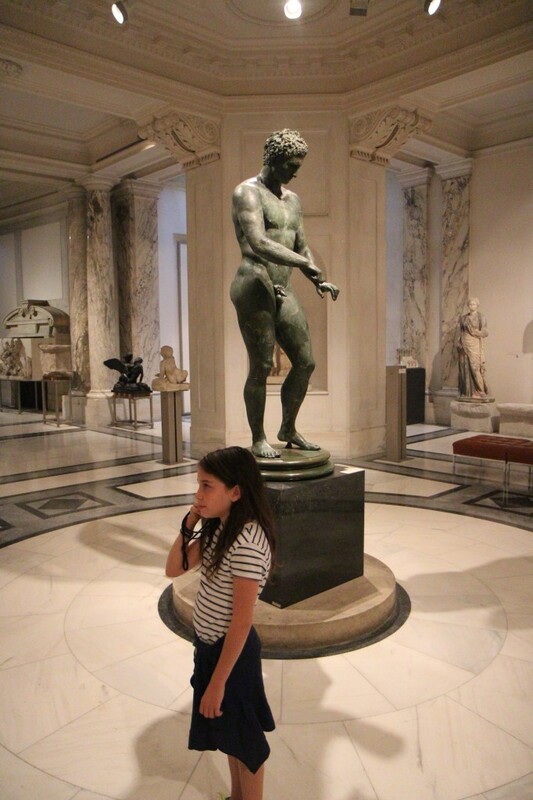 Keep doing this until the museum guard asks where your parents are. 3. Sit on the low brick wall placed in front of the preserved section of the underground city wall with your coffee. 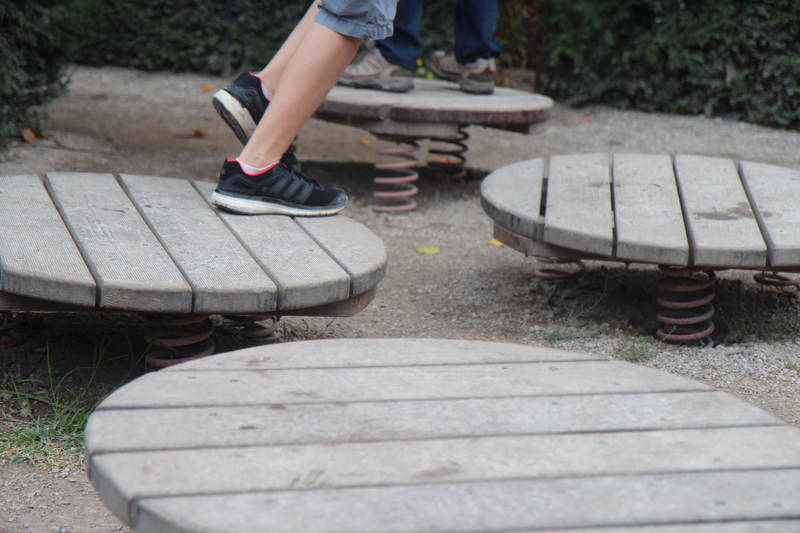 Let the same guard who spoke to your child come tell you that you cannot sit on the perfect-height-for-sitting wall. 4. Bounce the coin in your hoodie pocket over and over and surprisingly violently, for fun. Accidentally bounce it out of your pocket and let it roll across the suspended walkway you are standing on. 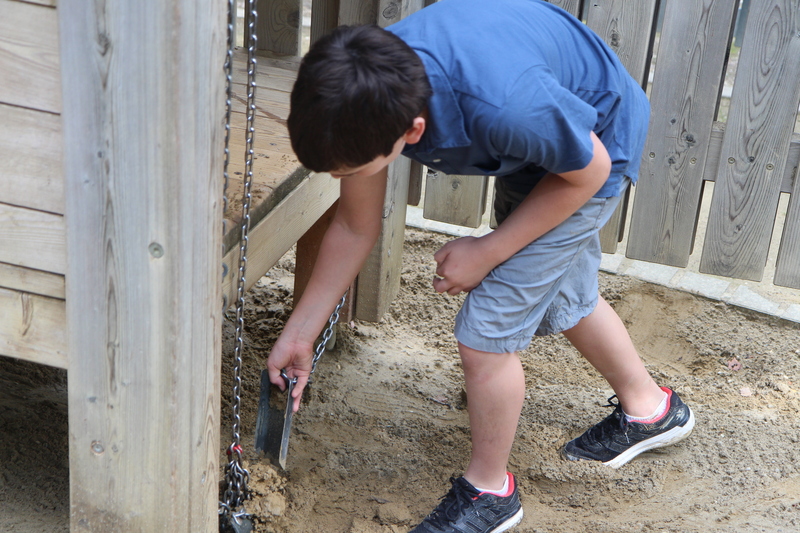 Watch as it rolls off the walkway and into the ancient city excavation below. Try to help your dad apologize to the guard in a foreign language. Don’t be surprised if the guard tells you that you are not going to get your coin back. 5. When the museum seems to drag on FOREVER and ever and you are hungry for a snack just drape yourself across your parents. Any bag or backpack they are carrying is actually designed to also be a handhold. Transfer as much of your weight off of your feet and onto their bag. Alternative method–Link your hands up around their arm or shoulder. Hang like a sloth on a tree branch. 6. 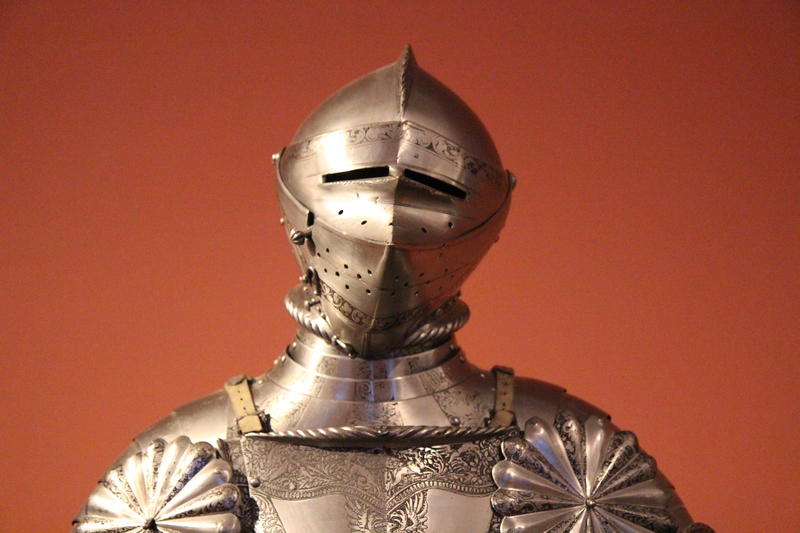 Get really excited about the arms and armor exhibits. 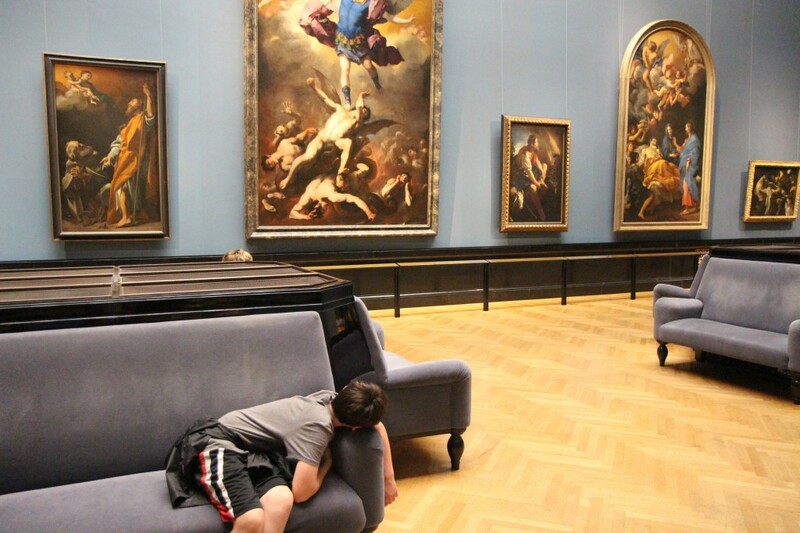 Ignore any suspicious stares from museum guards. 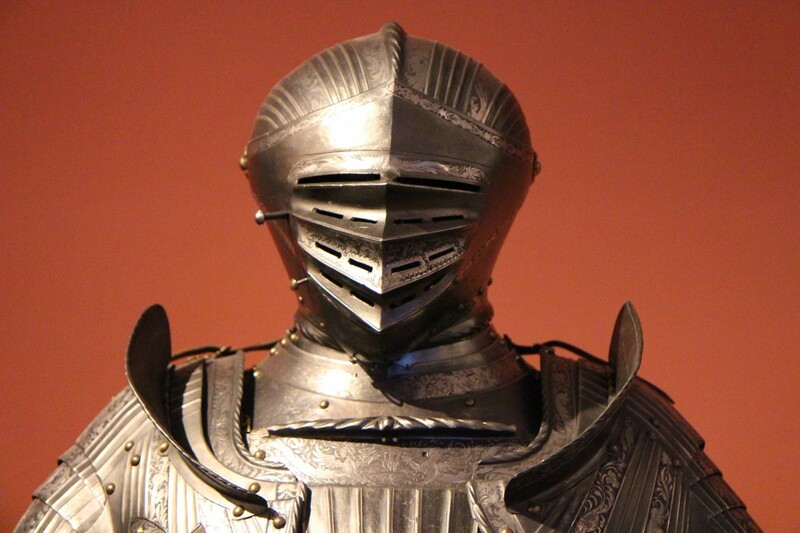 Pick your weapons and suits of armor since you are actually living in a Ranger’s Apprentice book. Try to figure out which one looks like a saxe knife. 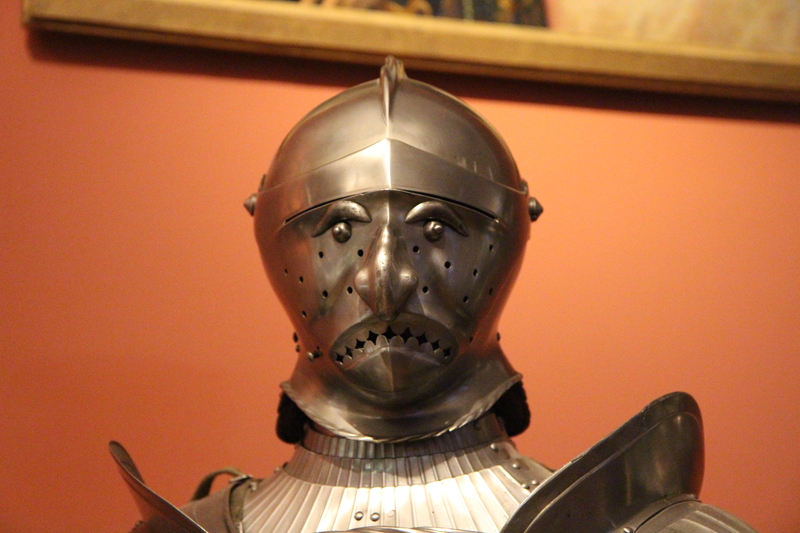 Point at the suits of armor over the railing but neglect to notice the laser beam you are breaking. Pretend you don’t notice the audio alarm that is going off (again). Do this three times. 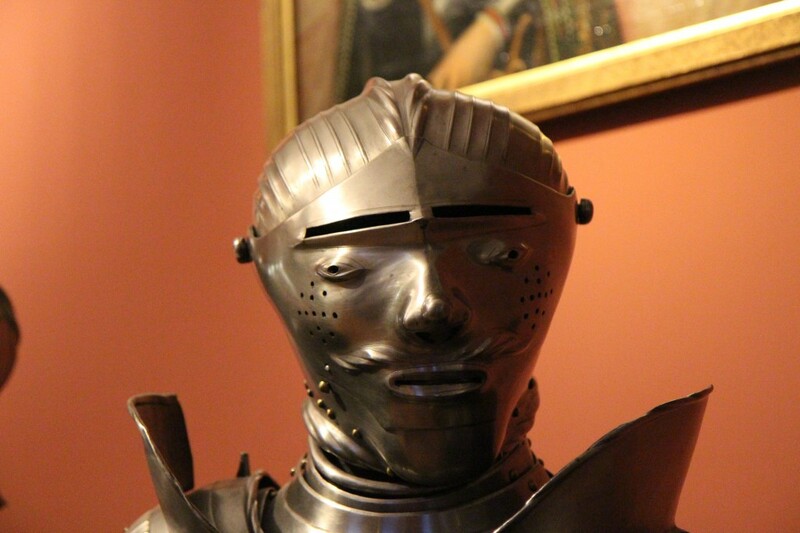 Try not to make eye contact with approaching museum guards. 7. Max perform the audio guide. Make sure you know how to turn it on and off, rapidly. Then see if you can break your record. Continue till it powers down and won’t come back on. Then, give it to your parents. 8. 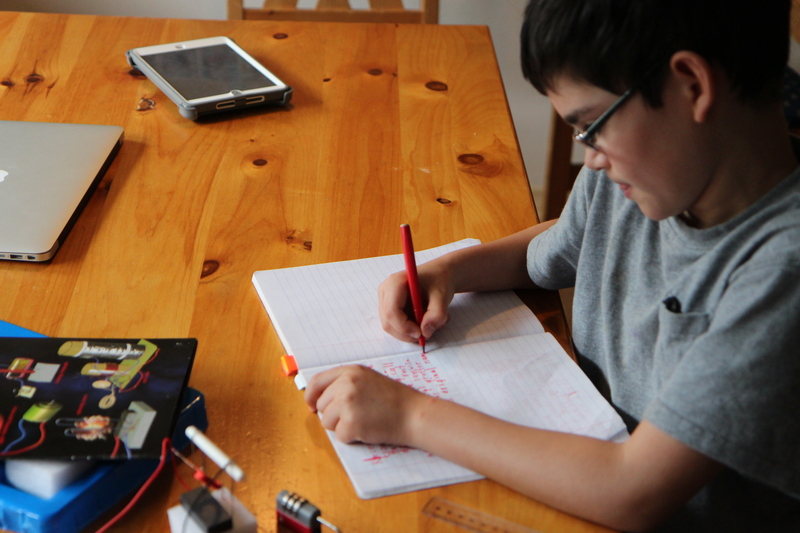 If any of the material seems a bit slow paced, get as far ahead of your family as you can. Go several rooms ahead in the museum. Consider it a challenge. 9. 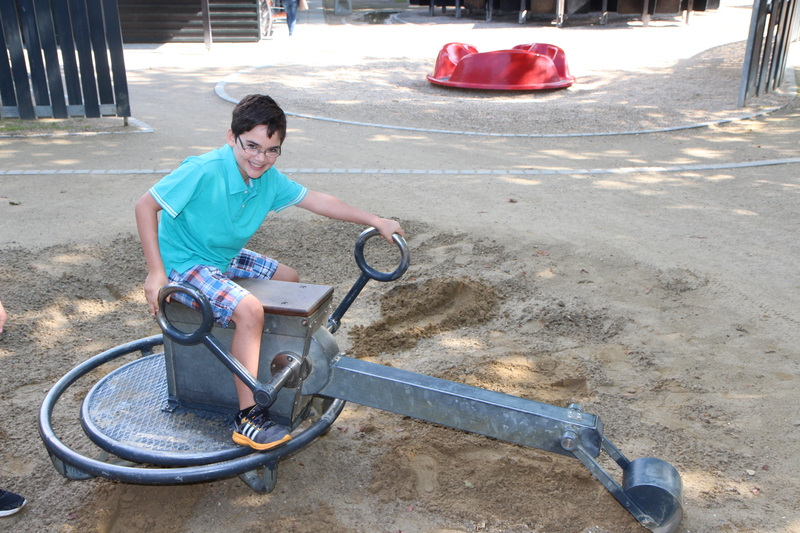 As you tour the underground salt mine, really get into enjoying the salt. Lick your hand, drag it along the mine wall for yards and yards then lick it again. Any wooden beams that are painted white should be similarly enjoyed. Do this as long as possible or until your parents notice. 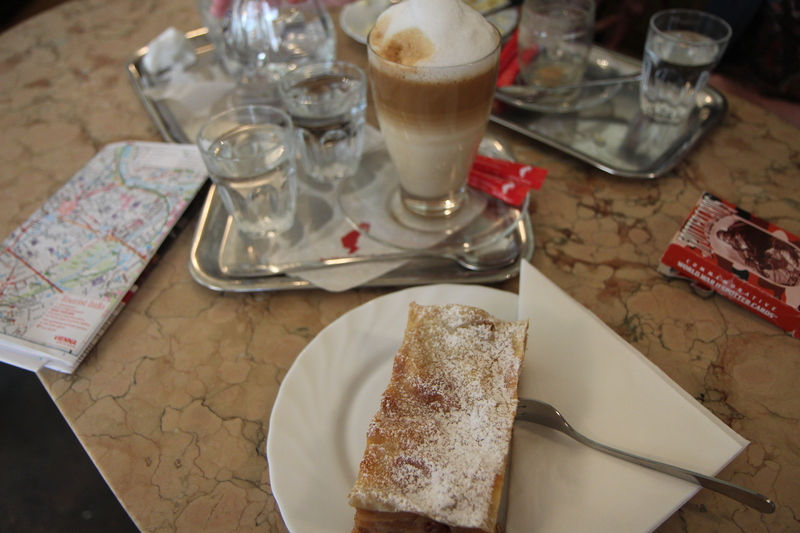 I half-sprinted to the town bakery for early morning bread–it was Salzburg day! 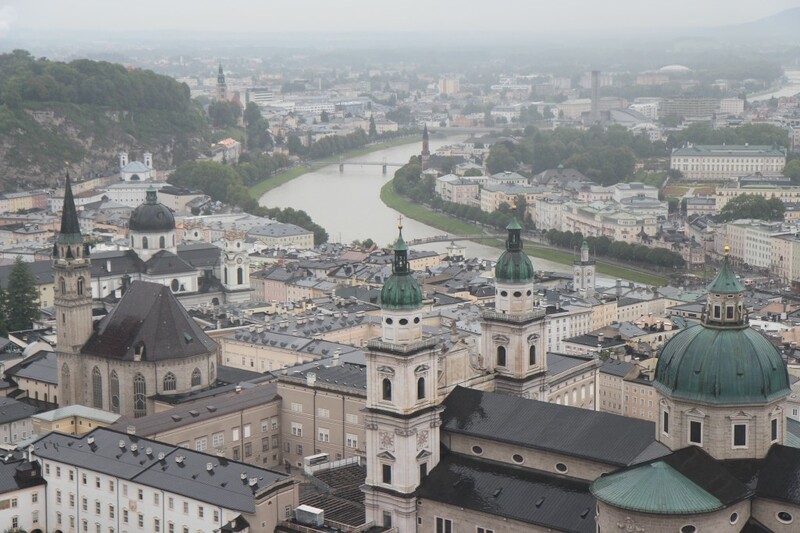 Salzburg is, of course, the town of Mozart, the Sound of Music and now, the Salzburg Summer Music Festival. 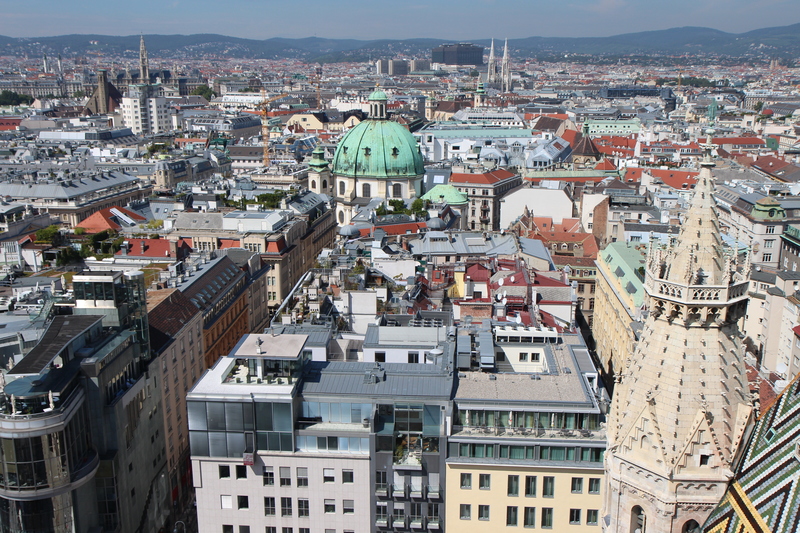 It is Austria’s fourth-largest city with a population of 150,000. 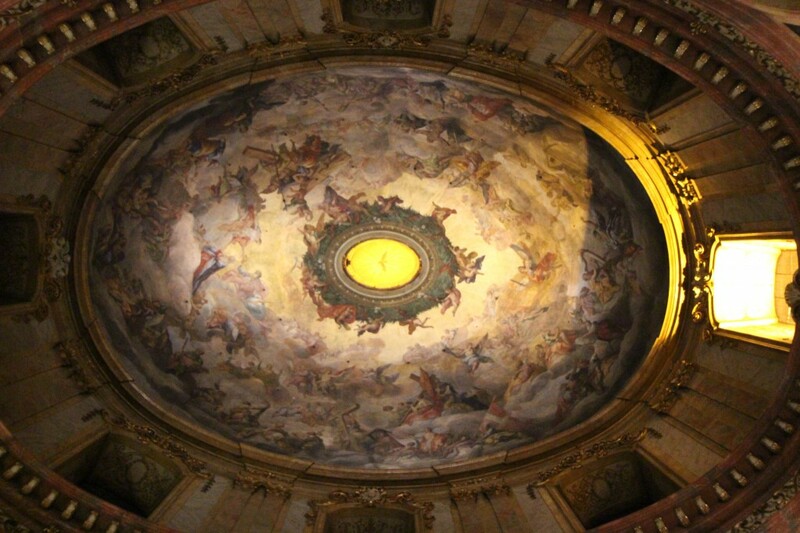 We’d read about the huge Salzburg Summer Music Festival that takes place July and August. It started to keep the Vienna musicians in summer employment. We checked online for music festival information and thought we’d hit the Tourist Information (TI) in town to find out our chances for a musical event. 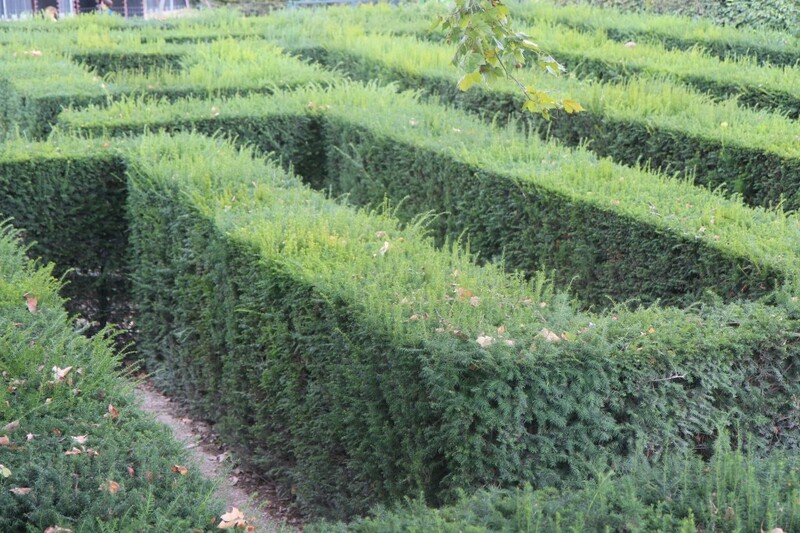 Our hoteliers had explained the vignette system for Austrian motorways. You stop in a petrol station and buy a vignette paper to put on your windshield as you drive the motorway. The cheapest vignette is about $11 for 10 days of coverage. If you are caught without one, the fine can be over $300. According to the hotelier couple, it is only five kilometers of motorway in Austria so better just to avoid the motorway and take the back highways. We would need to be careful to diligently avoid the motorways. The forecast called for rain and the clouds agreed. We hoped the gloomy sky, rain, dark clouds on the horizon and wet roads would keep the crowds down in busy Salzburg for our 100 km drive. I know it will shock you, but I was not the only driver with that notion. All told, it took us nearly four hours to inch those 100 km. She didn’t say it, but I’m sure Lisa was impressed with my hours of small-town driving. We ended up with some small upset stomachs. Thank God for plastic bags. We did stop a bit to take breaks and enjoy a snack or two from our stash. We finally neared the city and couldn’t move. A sign declared the city center was closed. We already knew there were no cars allowed in the old city center so we had to stop at a roadside TI (tourist information) to ask about that one. It meant the city center parking lots were closed and drivers would park in the park & ride spots north and south of city. We headed for the airport park & ride. Figured out the ticket system and bus lines, and jumped on the #10 line— with a whole lot of other people. 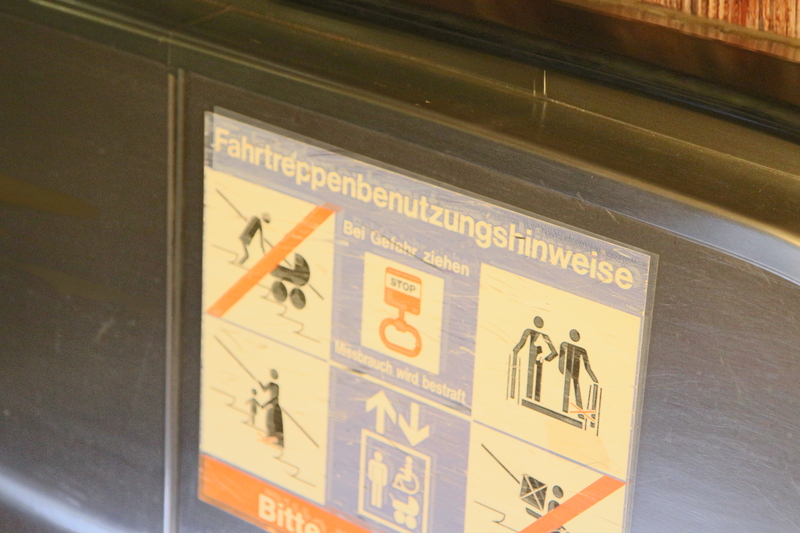 Each stop the driver made, you were just sure that no one else would be able to squeeze in. At several stops, waiting passengers just looked in, shook their heads and waited for the next one. One older lady boarded then nearly fell back against the doors as Lisa reached out and helped steady her. A whole lot of people would not be held back from this jewel of a city, no matter the weather. 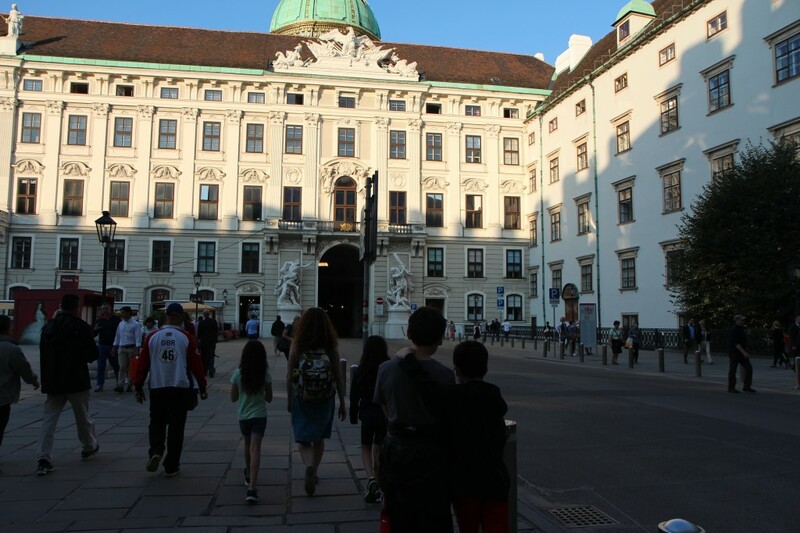 We made it into the city center and headed for the Mozartplatz. 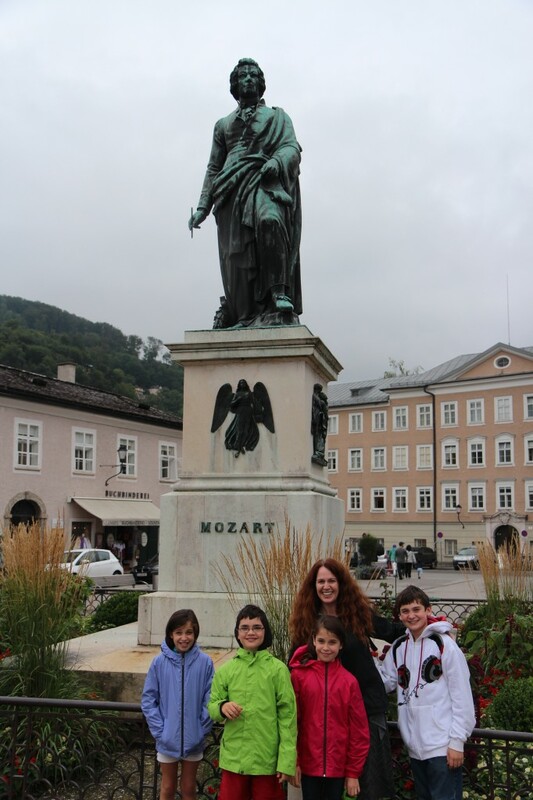 This square holds the Mozart statue erected 50 years after Mozart’s death. This first civic celebration of his life cemented his emerging legacy and drew his two surviving sons as well. 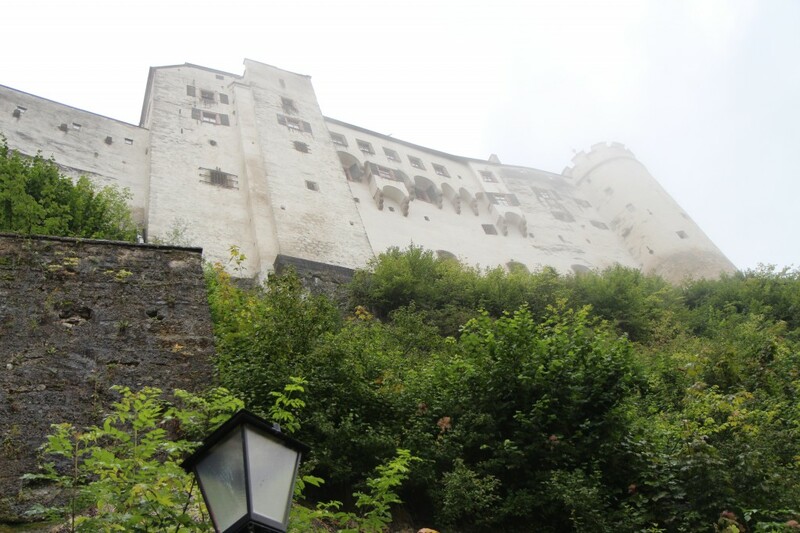 We hiked up to the imposing Salzburg castle (Hohensalzburg Fortress) in the pouring rain. This fortress was so formidable it was not attacked for over a thousand years and remains the largest medieval castle in Europe. Modern weapons eroded the significance of this older style of fortress and the French Army occupied the castle without a struggle during the Napoleonic era. The picture of the door handle shows the turnip as it was the royal family’s seal. 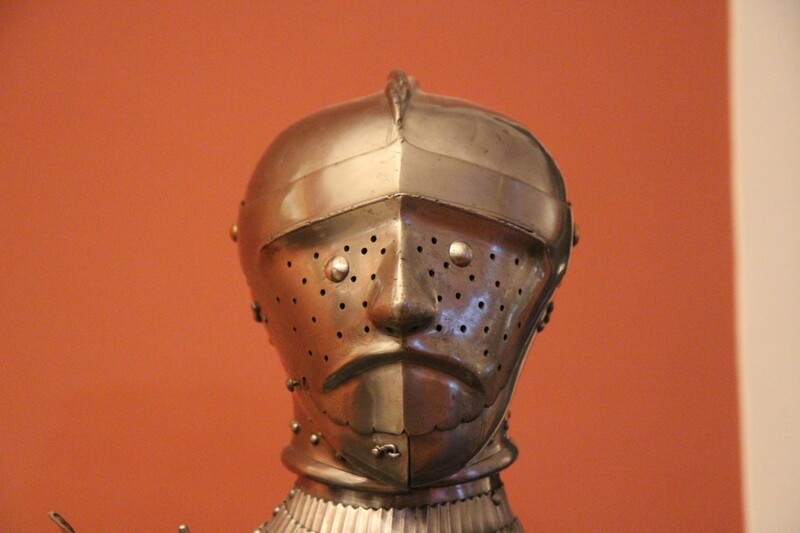 We nearly had to drag the boys out of the armor and torture room displays. 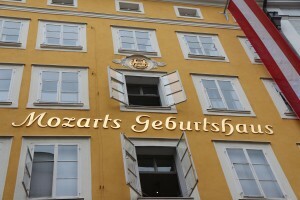 Mozart’s birthplace (Geburtshaus) was next on our list for our remaining time. 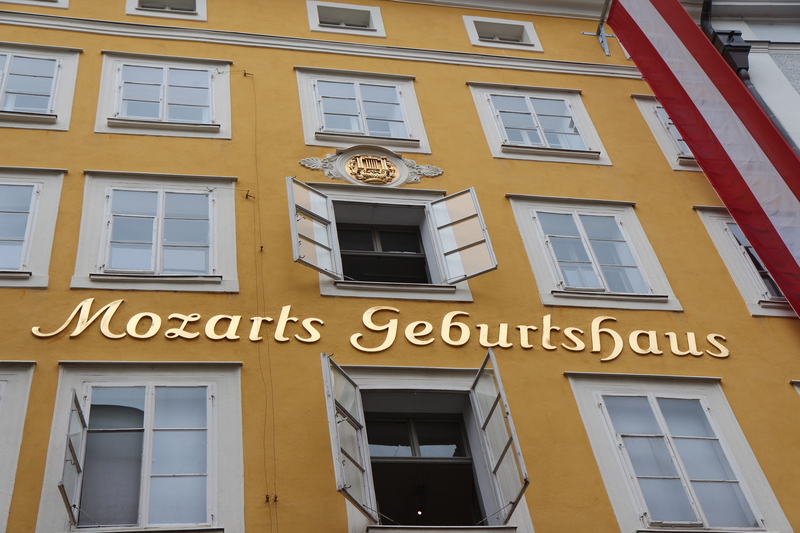 (we would simply have to see the nutty Sound of Music tour another time) The Mozart family lived in the third-floor apartment for 26 years and the building had already been there for over 200 years. The kitchen technology of the day included a drain in the window frame for waste water. We stood in the room where the great composer was born in 1756. The room includes his violin given to him at age 6. 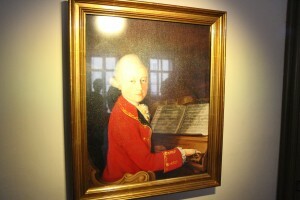 Wolfgang’s father, Leopold, was a composer, conductor, teacher and violinist in Salzburg. Seven children were born to Leopold and his wife but only two survived infancy. 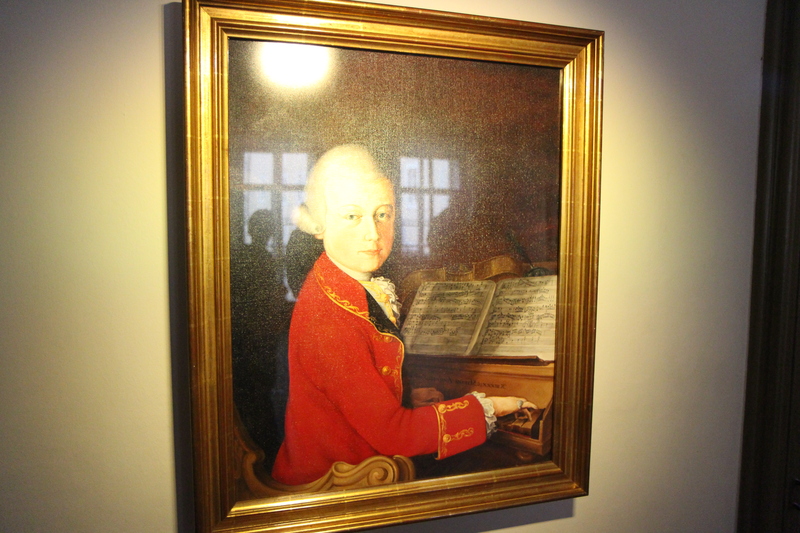 He molded the young Wolfgang and encouraged, some say prodded, his natural talent. Wolfie’s sister, Maria, also toured with Wolfgang and his father for several trips. I snapped a picture of this portrait before noticing the “no photos” sign and the lady in the corner reminding all the would-be photographers! A moderately complex sheet of music contains Leopold’s note that his young son spent from 9 to 10:30 PM one evening learning and mastering the piece. Wolfgang’s many trips took him on the road performing for over one-third of his life. He finally fled Salzburg (and his father’s influence) for the larger Vienna after failing to be hired by any of the great courts of Europe. 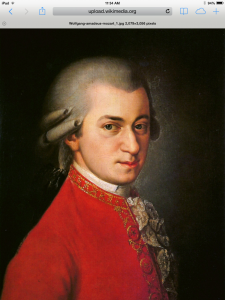 As any good fan of the movie Amadeus can tell you, Mozart was a true prodigy and died young (age 35). Hard to imagine, but the policy of the time was to appease a potentially revolutionary public by limiting the privileges of the nobles. Coffins were reused and the number of candles at funerals was even limited. These facts led to the idea that Mozart was given a pauper’s burial. 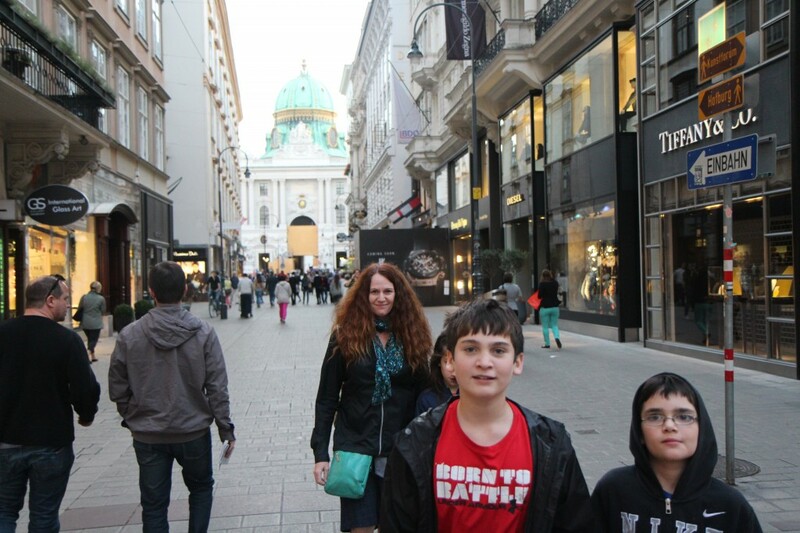 We walked down the shopping street, the Getreidegasse. A street of commerce since the days of Rome, the Getreidegasse is well-known for its wrought iron shop signs. Even the McDonald’s golden arches have been classed up into iron. 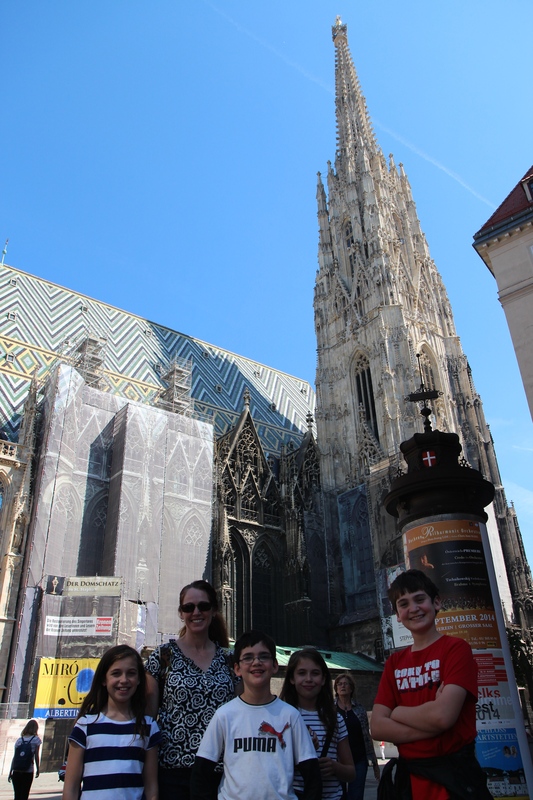 At the end of the Getreidegasse we found a tall, peaceful cathedral squeezed up against the cliff face. We went in and lit a candle. A dear friend had lit a candle for me when I was in the midst of stem cell transplant recovery and we wondered if it was the same church. 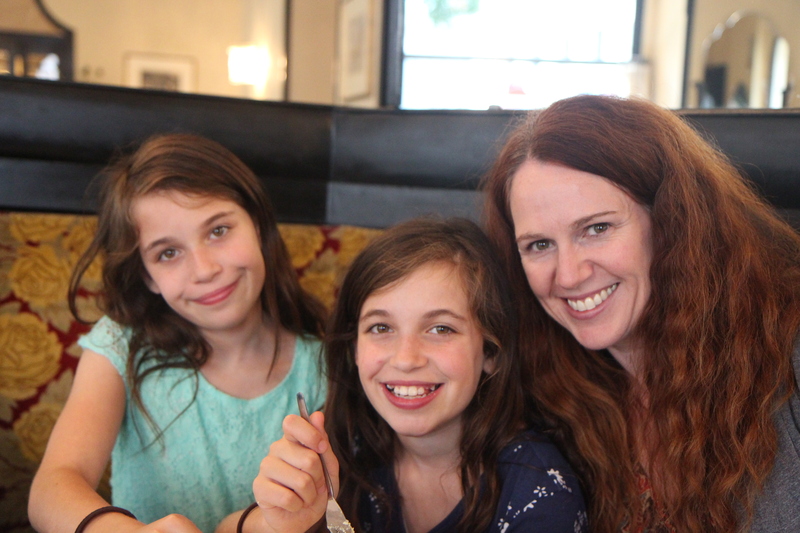 We grabbed a quick, simple seafood dinner in the bargain place by the river. Then walked across the bridge to get ready for the show. In keeping with the classical music exposure that Austria prides itself on, we’d purchased tickets for a Mozart marionette theater. 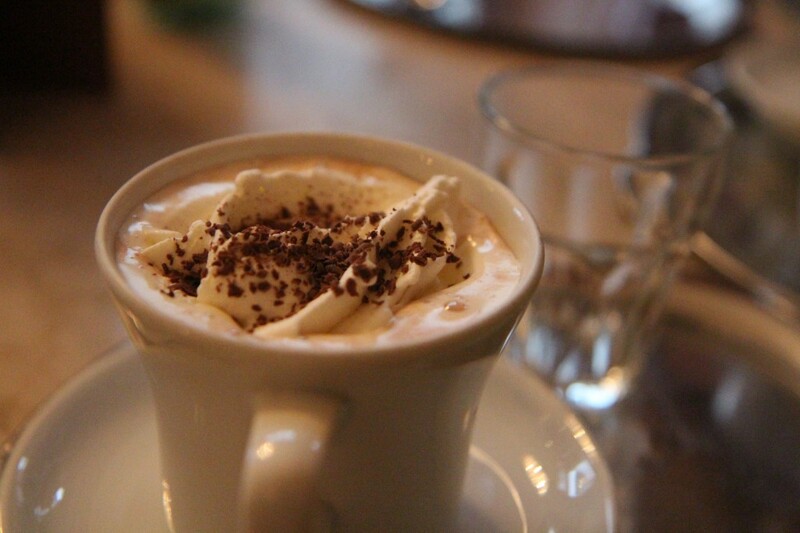 We popped into the Viennese-style coffee house Cafe Bazar for a pre-show coffee and hot cocoa. Then ambled along as the rain was dying down to the marionette version of Mozart’s opera “The Magic Flute”. There were no pictures allowed during the show but I managed a few of the theater. 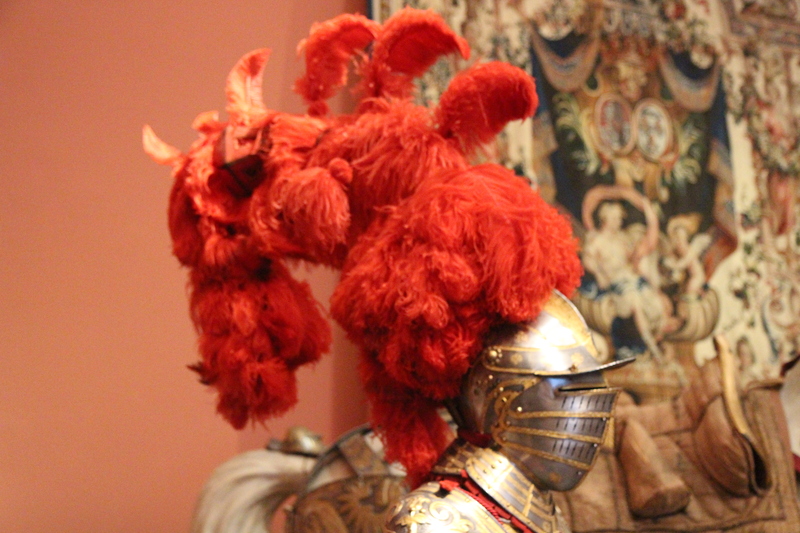 The theater boasts a proud history and many puppets displayed from past shows. 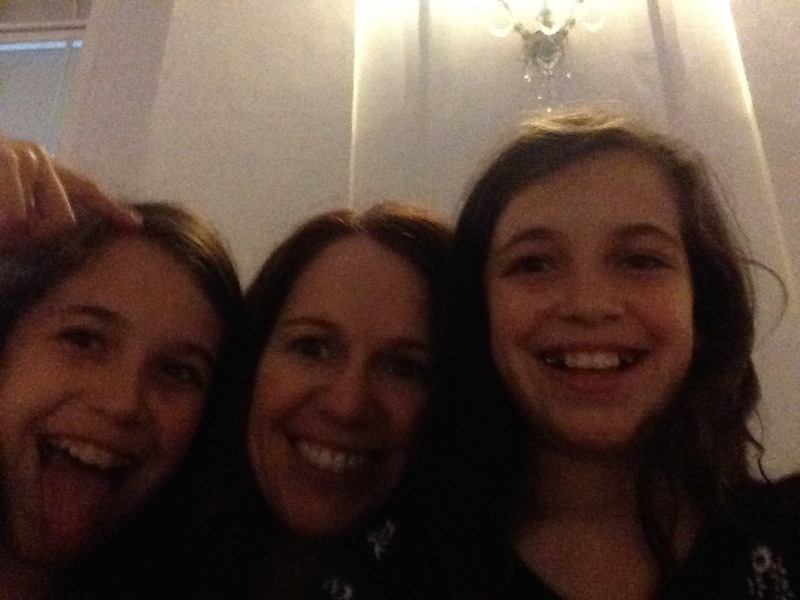 During the first act, the girls were alternately trying to sit in my lap to see the performance. They were quietly discussing whose turn was next. An older lady three rows in front of us, snapped around, gave us a loud and pointed “Sh” and whipped her head back front again. The girls slumped into our laps. Quite upset, they whispered “We weren’t doing anything wrong.” Lisa and I consoled them and at intermission it provided perfect fodder on talking through how we are to treat others. 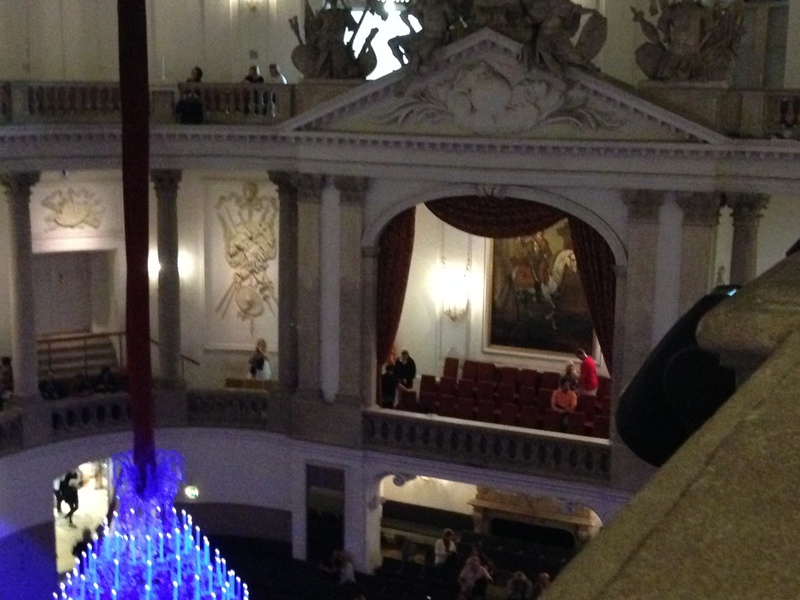 The puppets were surprisingly lifelike and brought life to Mozart’s opera. The show was nothing like the Sound of Music scene. Periodic synopses on the wall, in five languages, punctuated key events in the storyline. The marionetters (?) had the figures move past each other (pretty amazing for puppets) and the soundtrack sounded like it could have been singers off stage. The sets and lighting looked right in line with any opera. 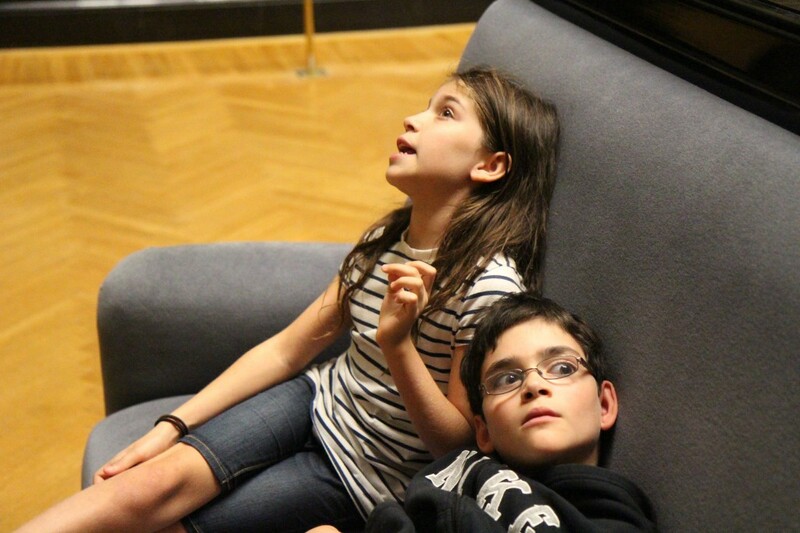 We hoped the kids were picking up some classical music appreciation in spite of–or even because of–the puppets! 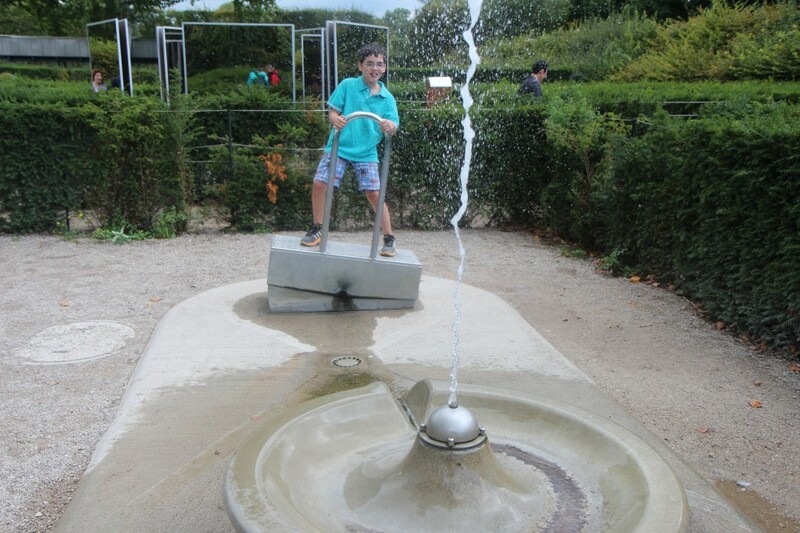 Leaving the theater late, we rushed back to the park & ride and started the drive back to Oberaudorf. The rain persisted, we tried to follow our route back but one wrong turn and we ended up headed down the onramp for the Austria motorway—still without a vignette. I crouched down behind the wheel and tried to imagine how the Austrian police caught vignette violators on their highways. I stopped at the first petrol station I spotted where a clerk gruffly pointed out that Germany was 100 meters down the motorway. I felt silly buying one at that point so we got back on the motorway and sure enough, we had succesfully run the vignette gauntlet. 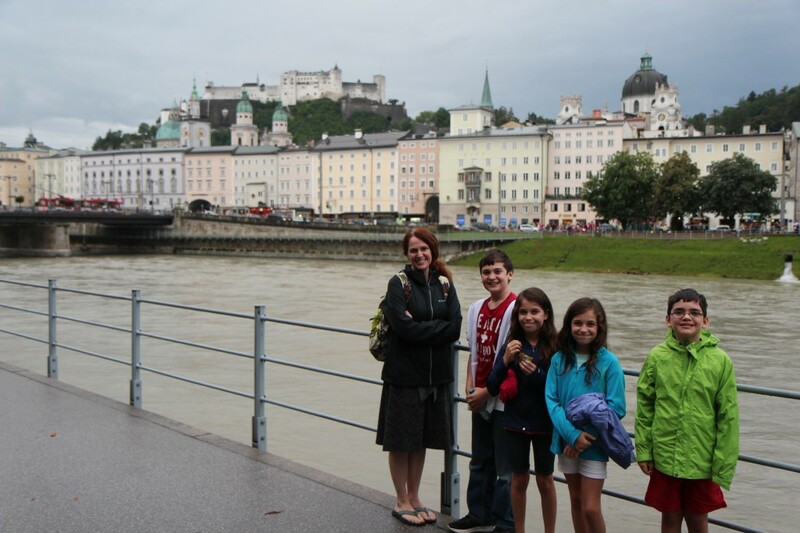 Salzburg—you hit us with punishing traffic and bad weather and we still loved you.